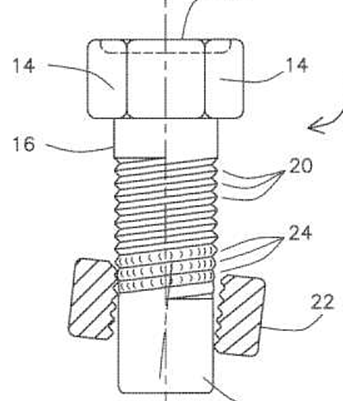 The fastening elements or connection of elements in this group can be employed in multiple technical application fields. 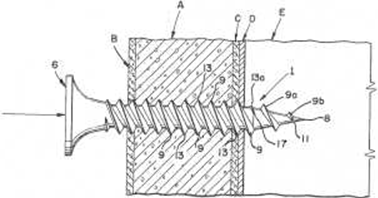 However, the focus is on the fastening element or the connection of elements itself. 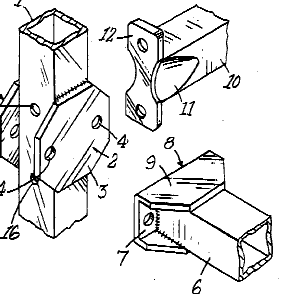 Fastening elements in this subclass are caracterised by their constructional or functional aspects. 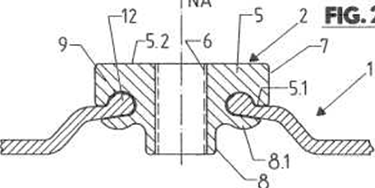 Fastening elements which are specially adapted or designed for a specific technical application are generally rather classified in the specific technical application field. 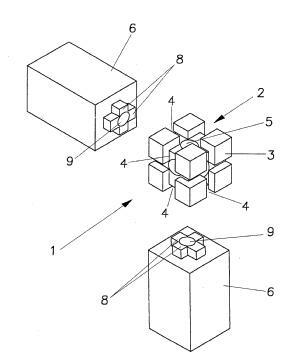 As a general rule, multiple classifications can be attributed to one document. 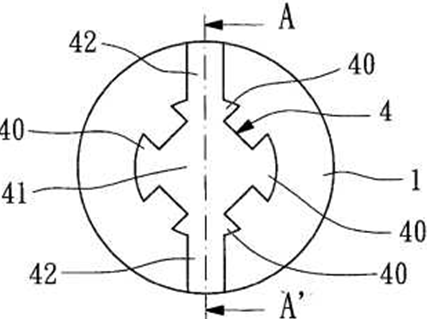 Symbols for inventive information and additional information are attributed to the corresponding fields. 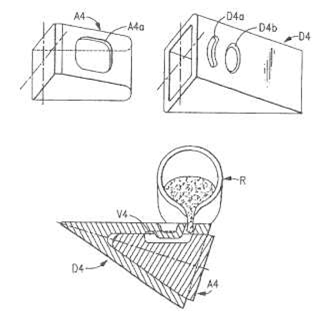 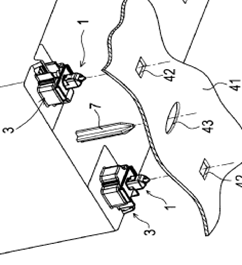 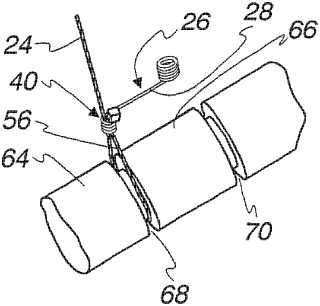 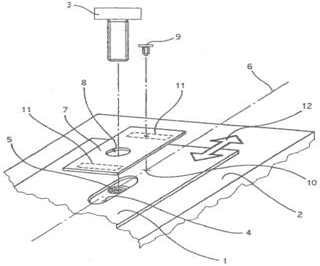 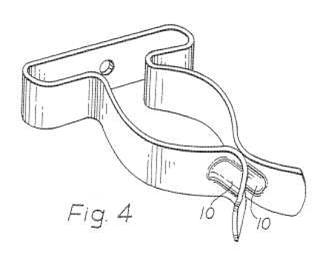 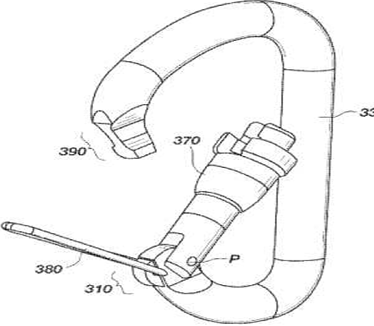 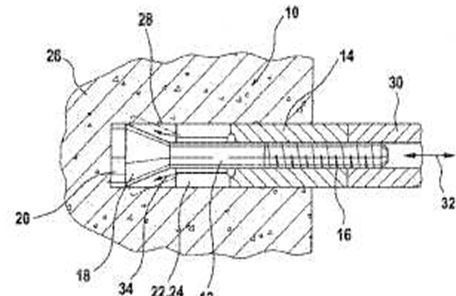 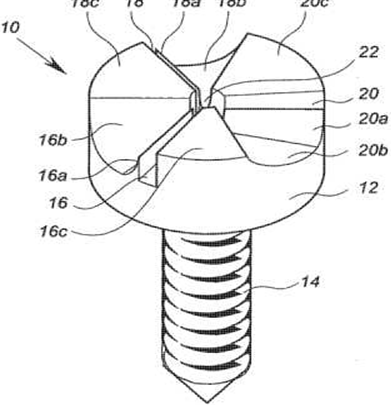 If there are interesting functional features of an invention specially adapted for an application, at least a symbol for additional information in F16B should be given to this document. 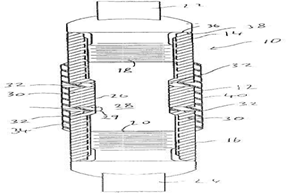 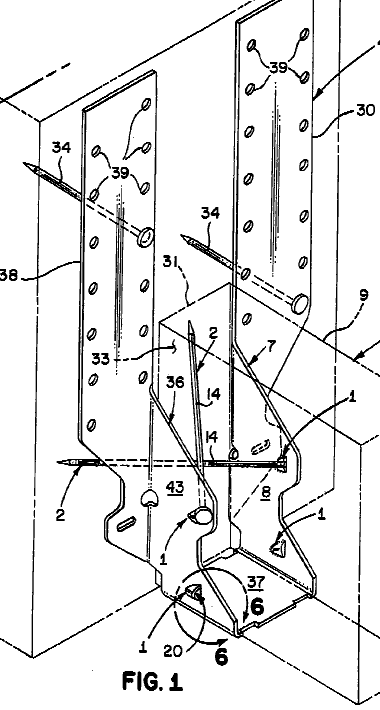 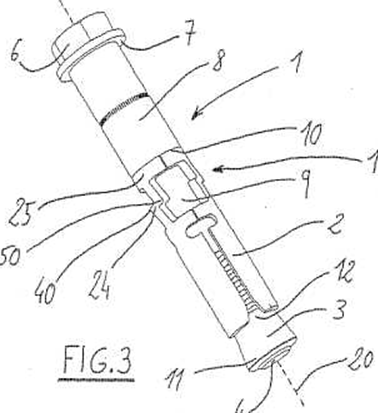 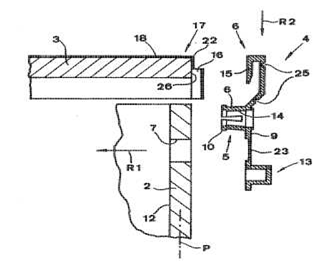 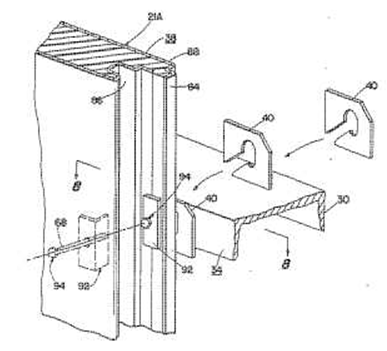 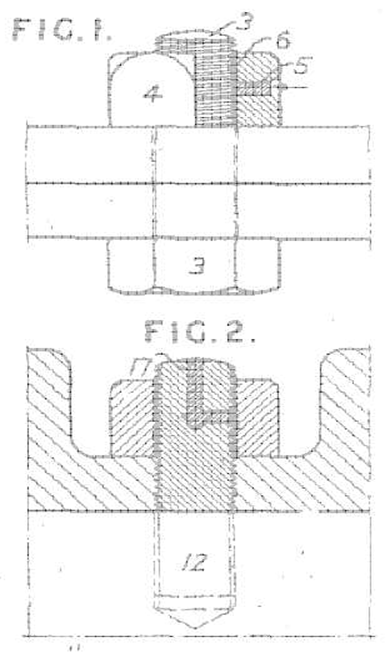 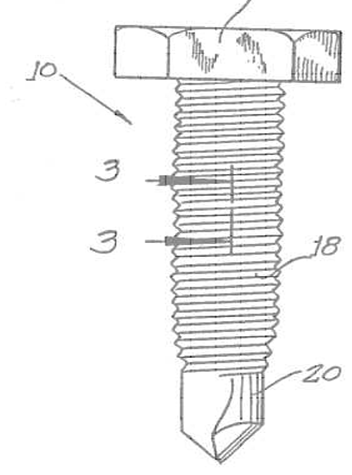 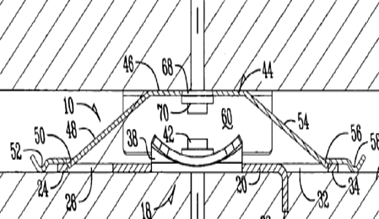 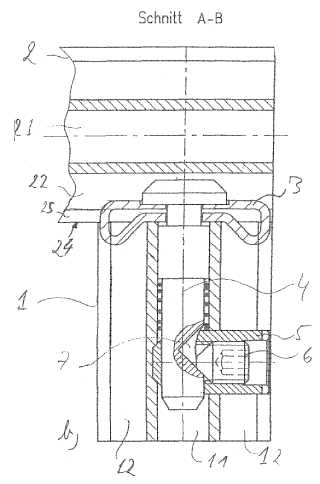 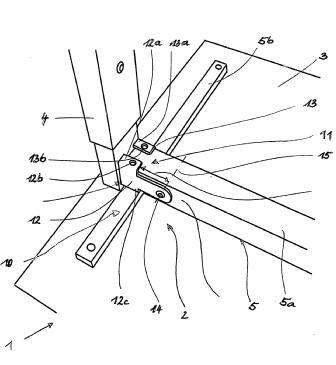 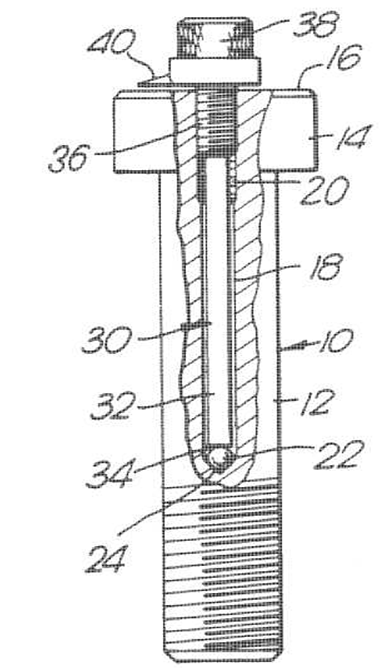 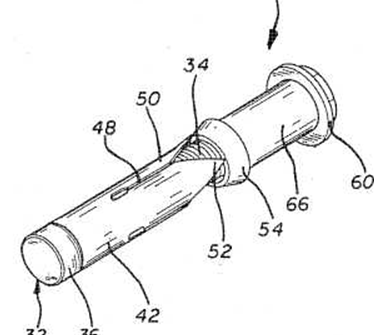 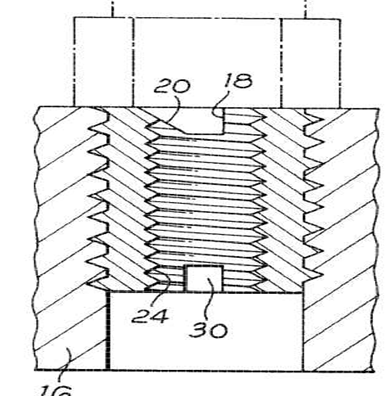 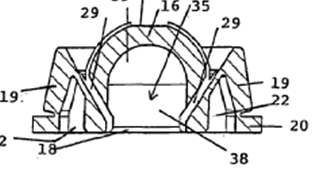 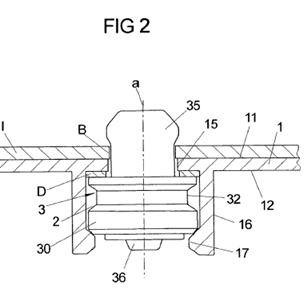 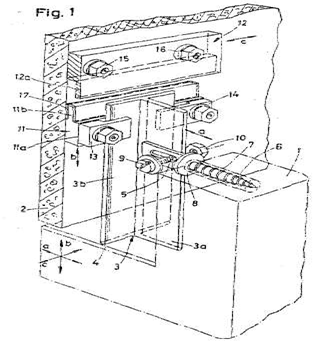 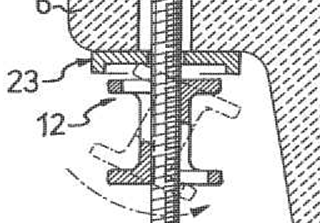 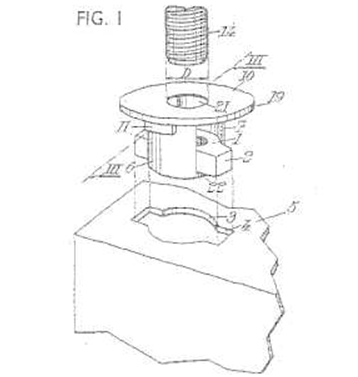 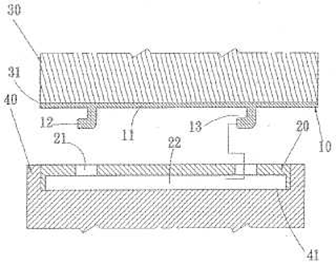 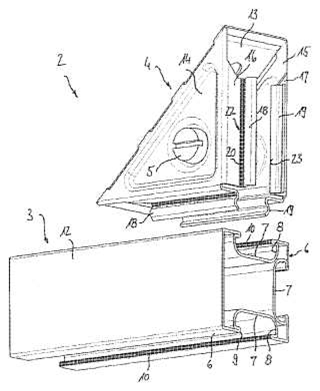 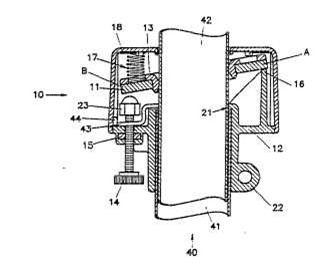 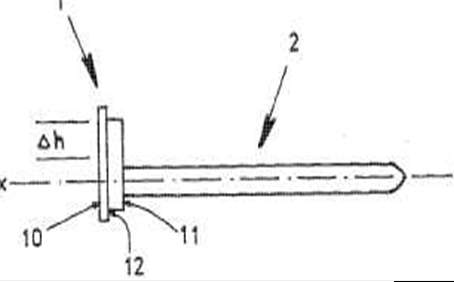 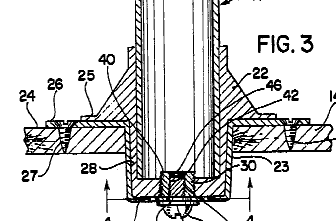 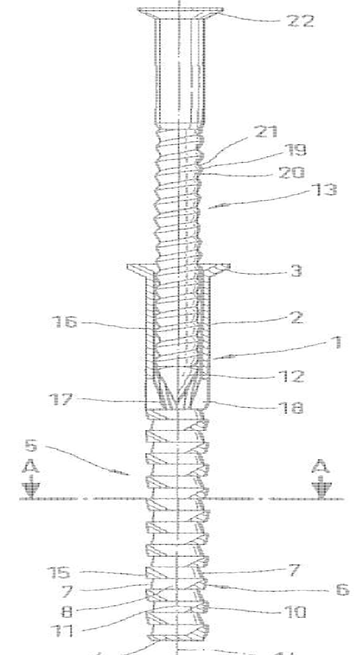 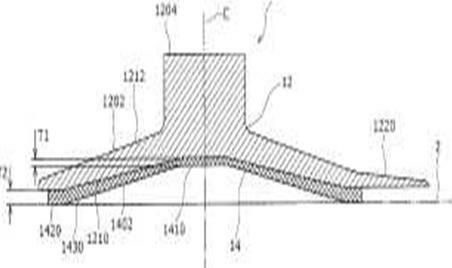 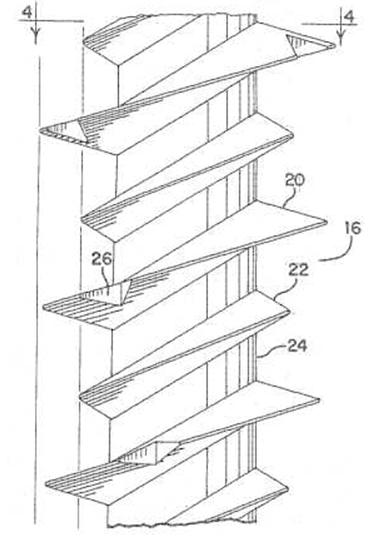 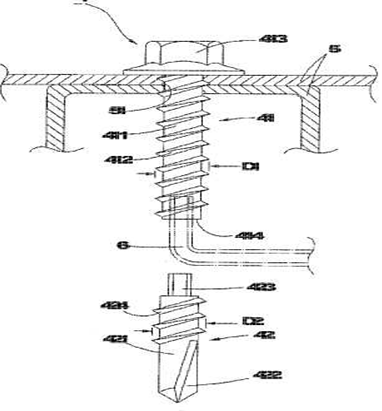 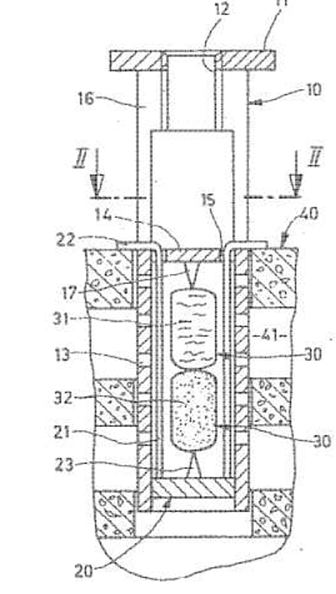 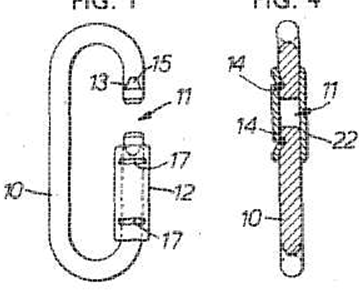 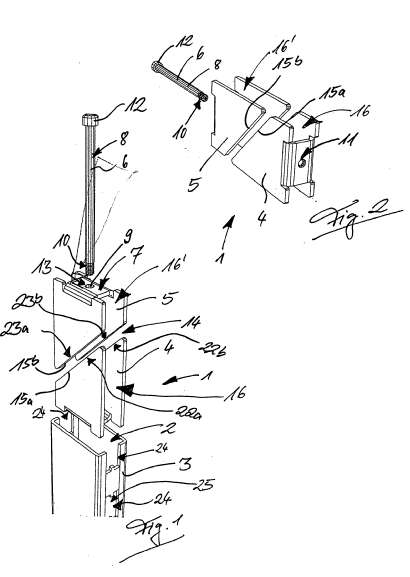 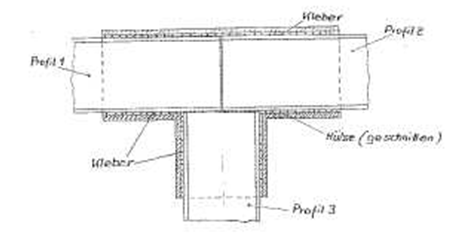 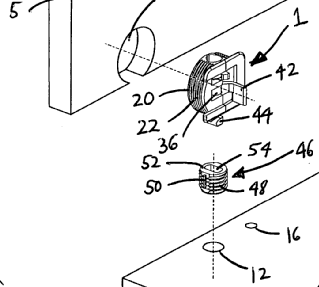 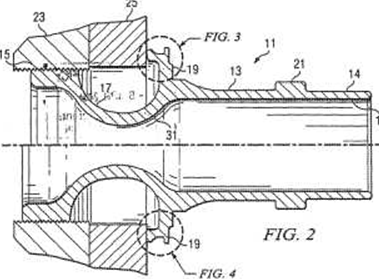 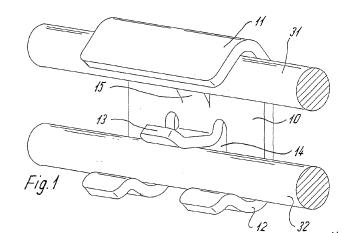 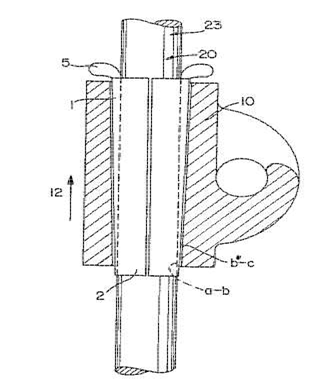 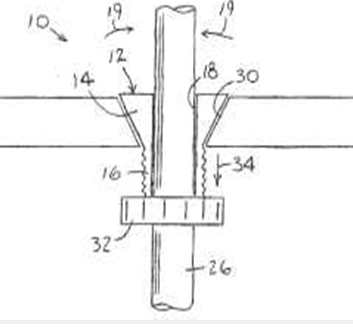 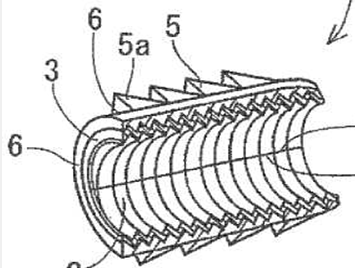 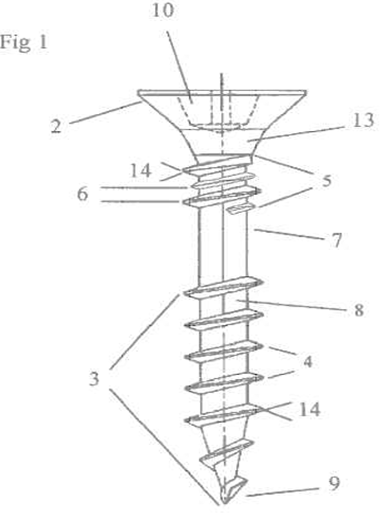 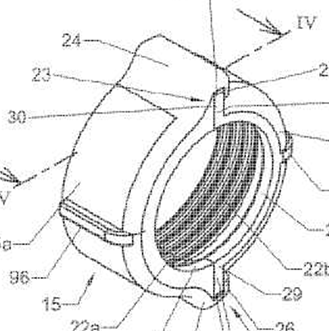 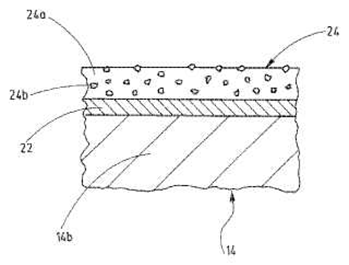 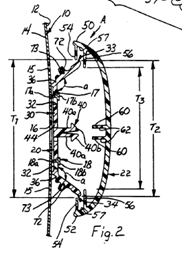 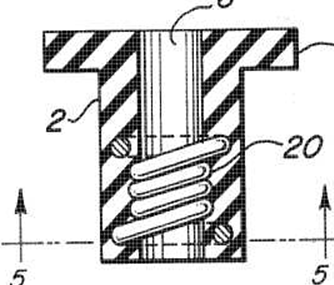 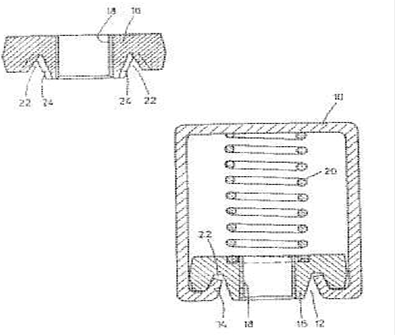 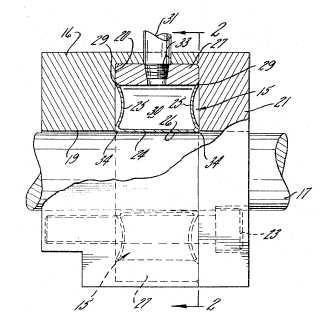 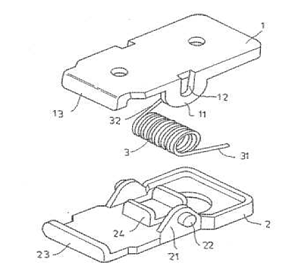 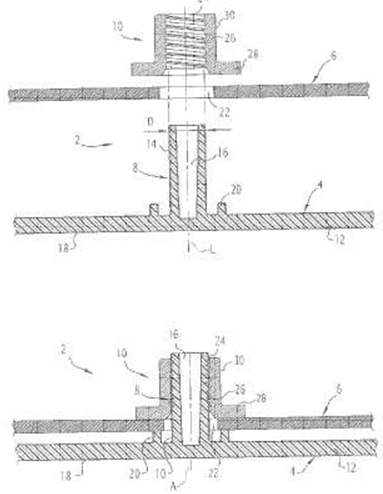 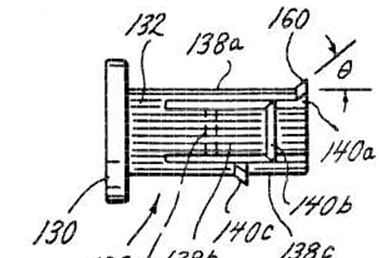 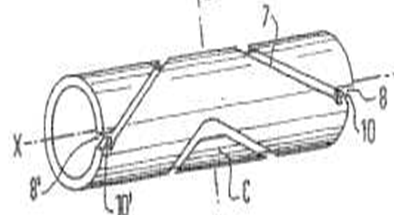 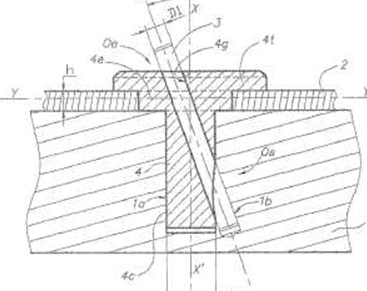 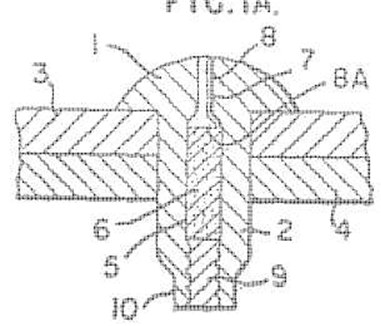 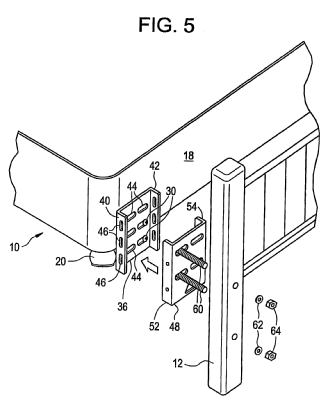 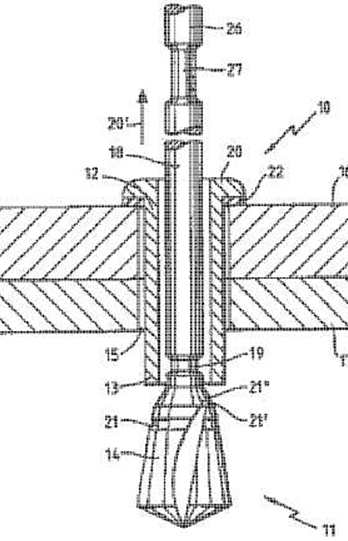 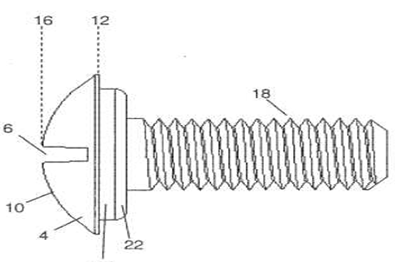 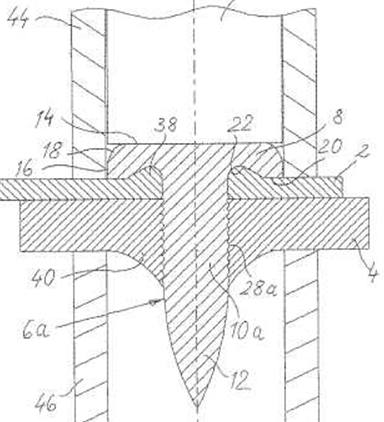 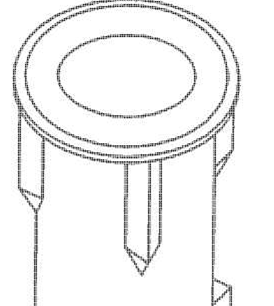 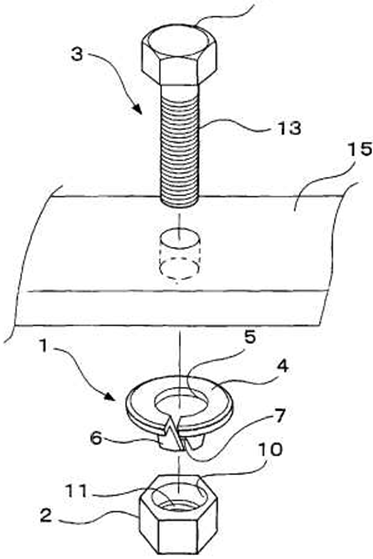 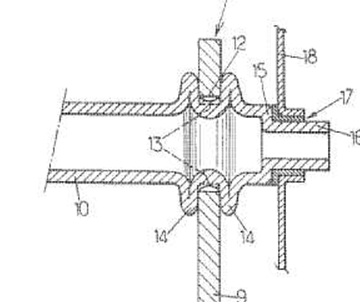 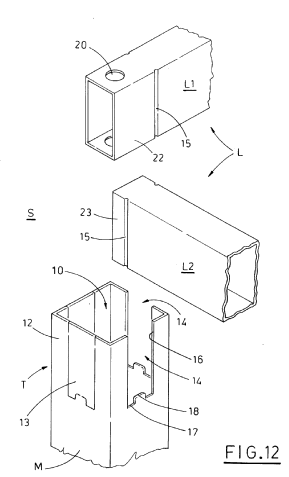 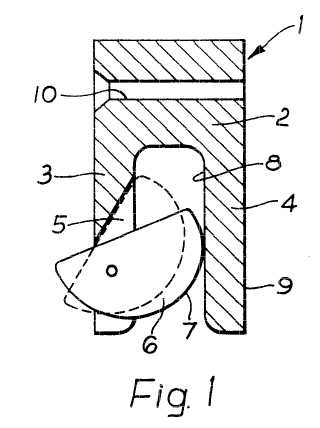 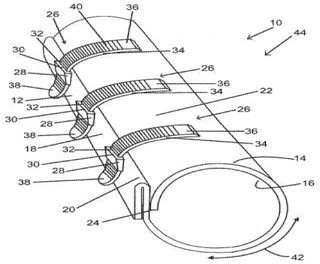 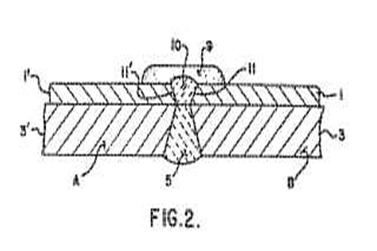 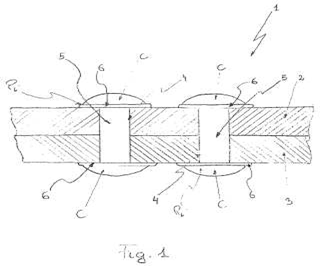 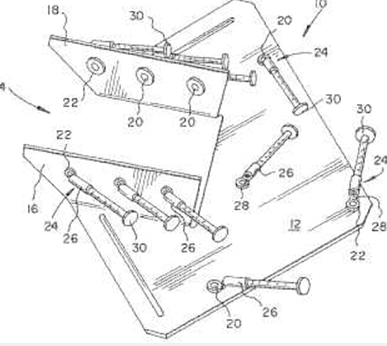 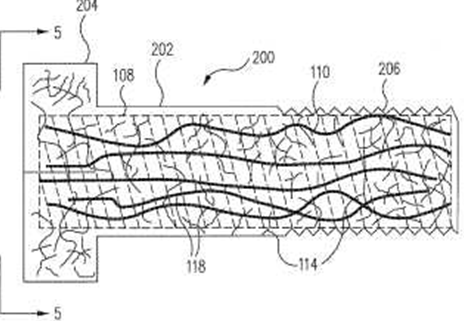 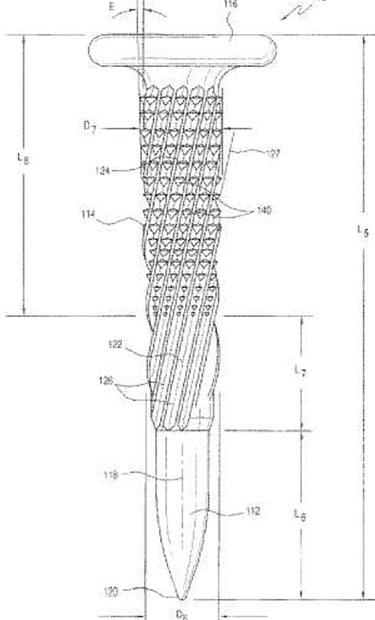 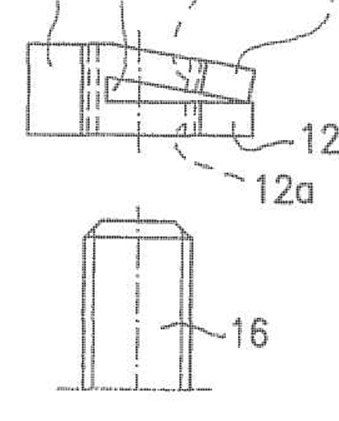 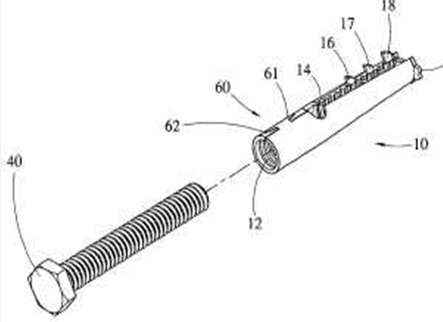 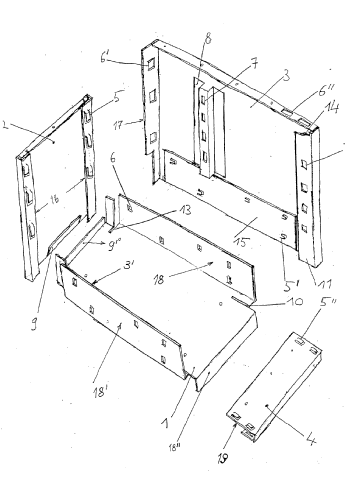 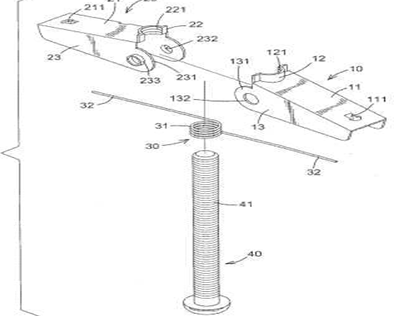 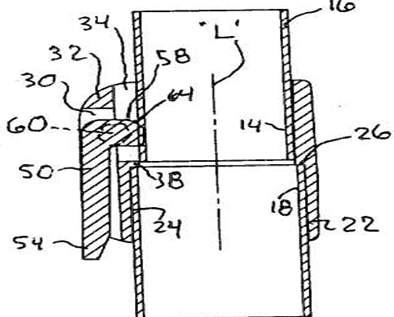 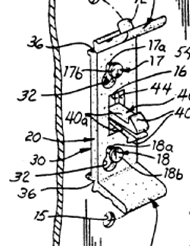 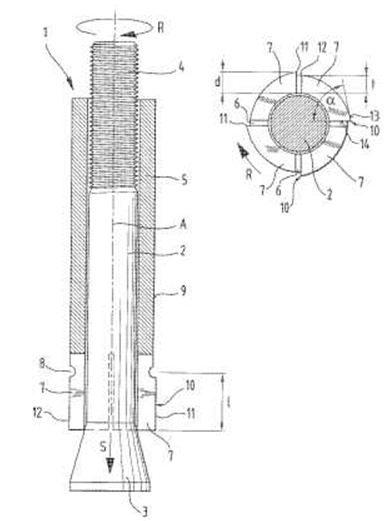 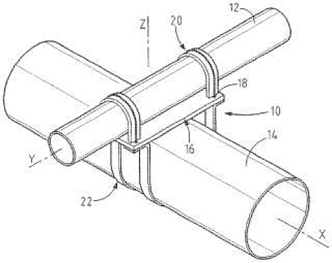 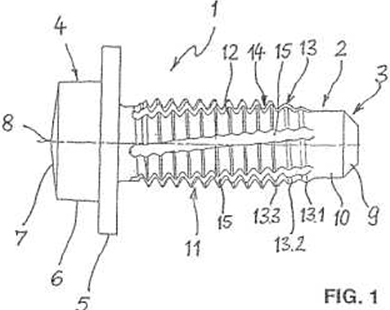 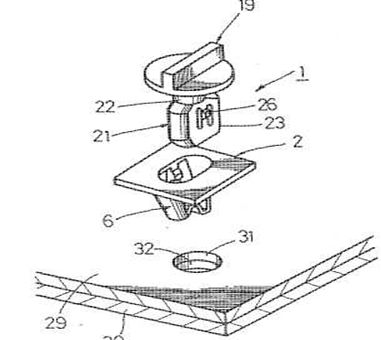 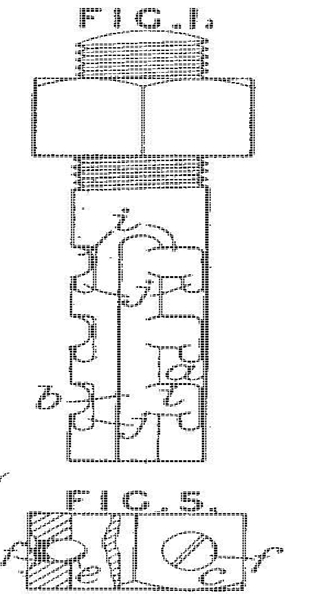 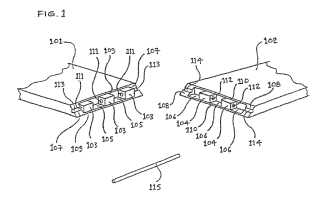 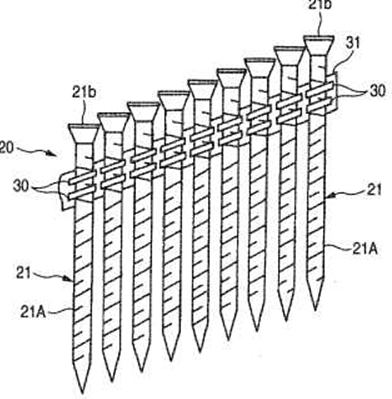 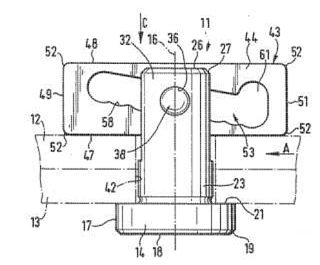 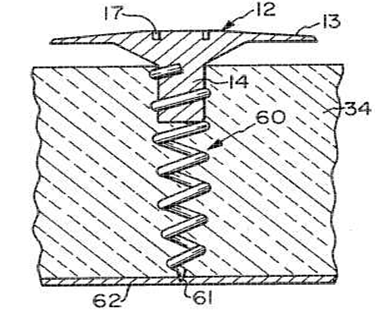 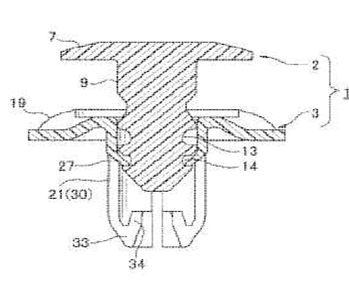 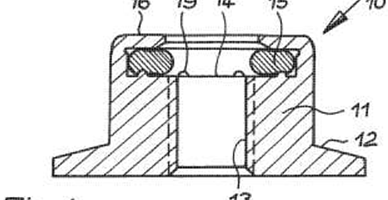 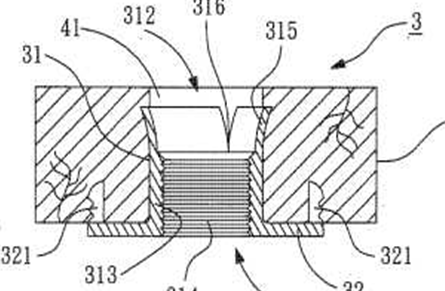 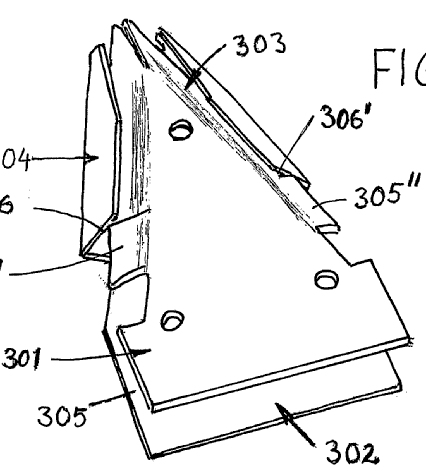 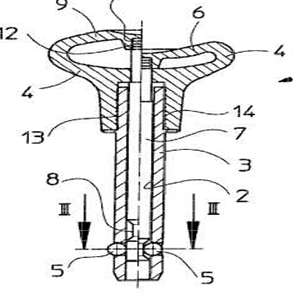 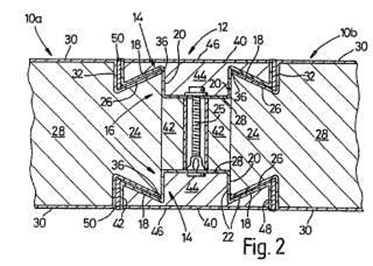 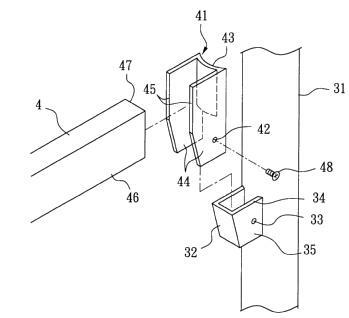 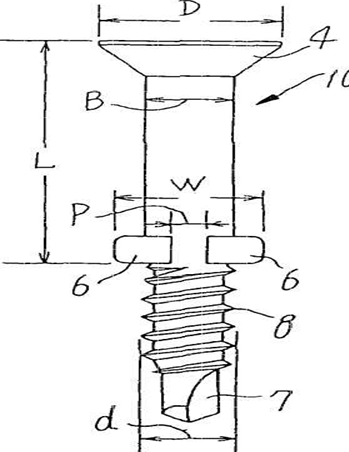 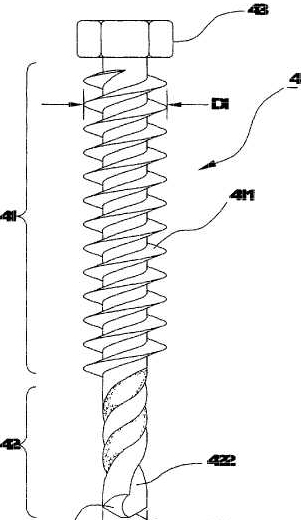 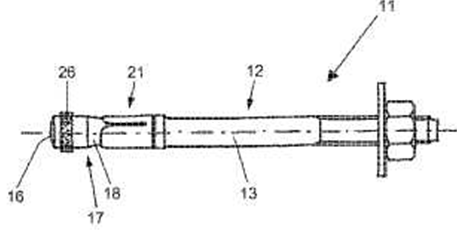 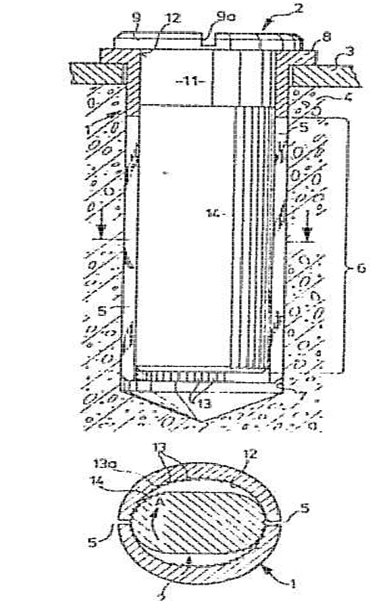 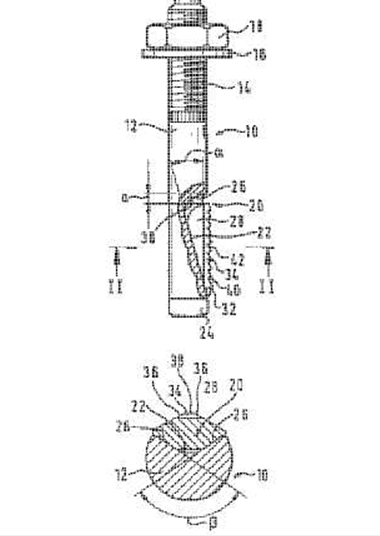 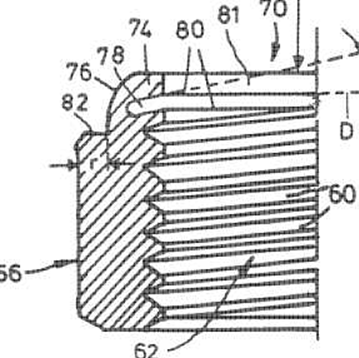 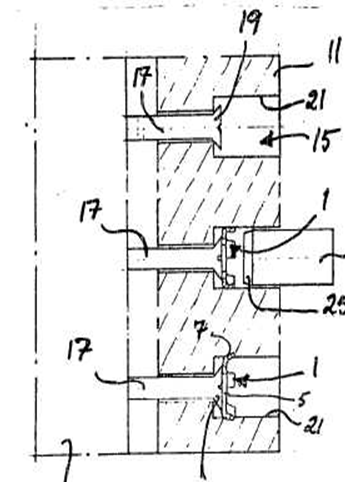 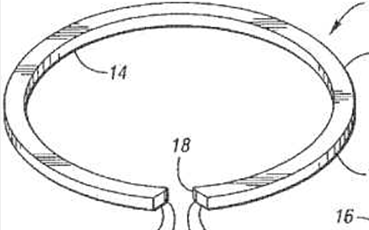 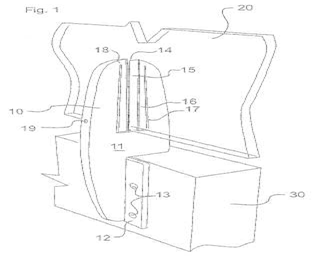 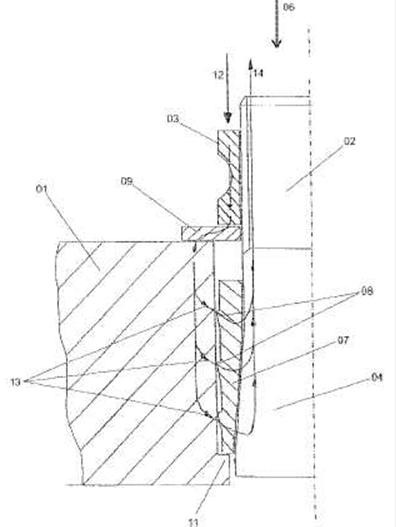 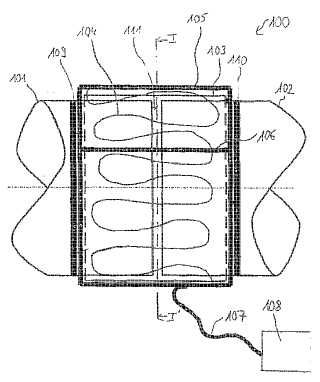 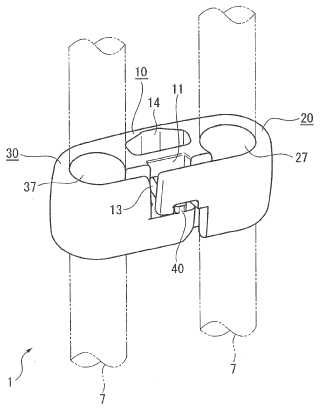 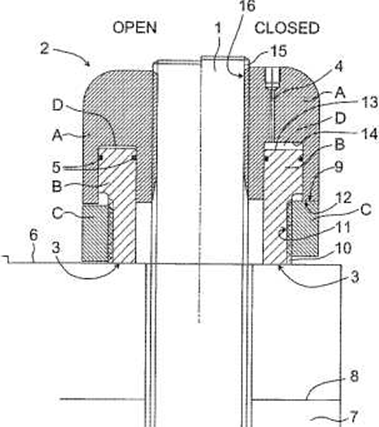 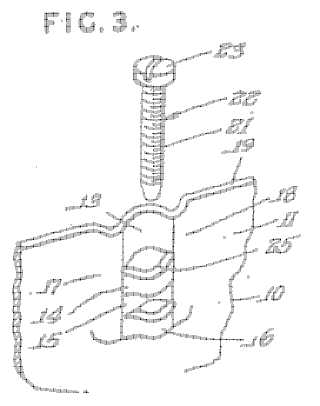 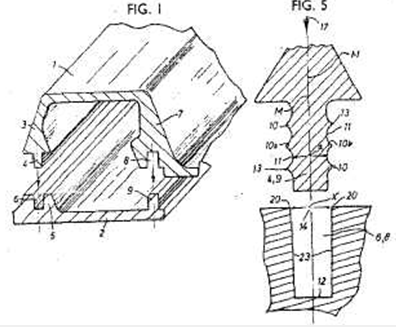 Many documents describe a fastening element itself and a connection comprising the fastening element. 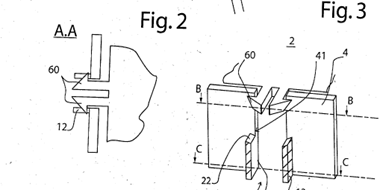 If the focus of such a document lies e.g. 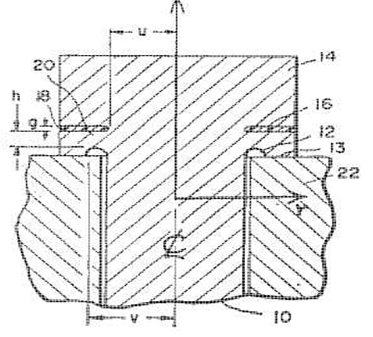 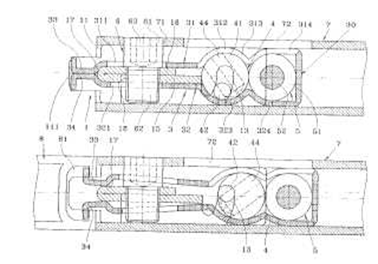 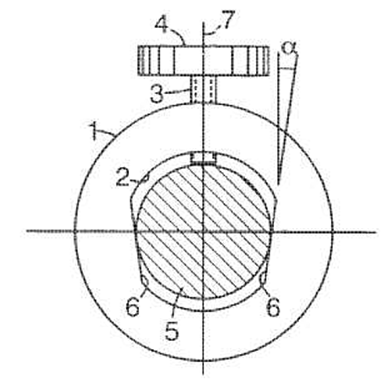 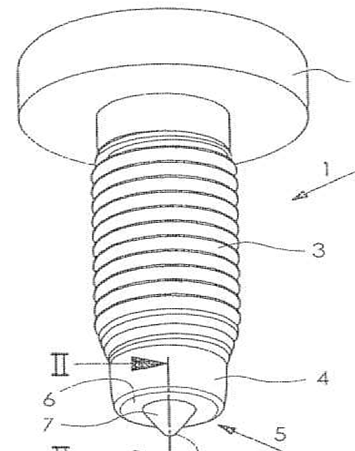 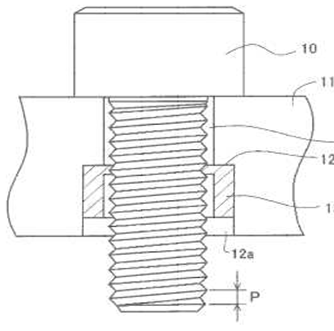 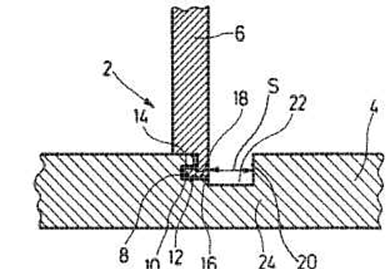 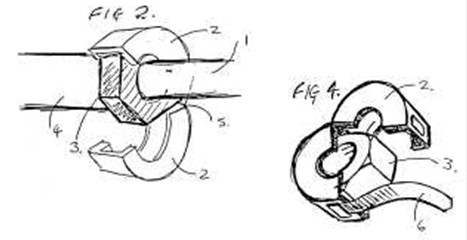 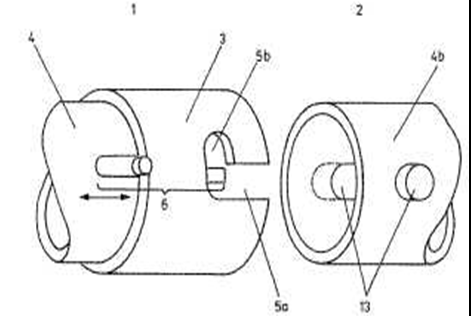 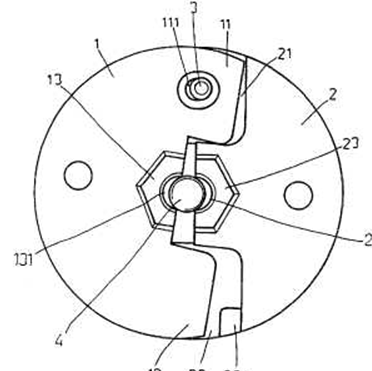 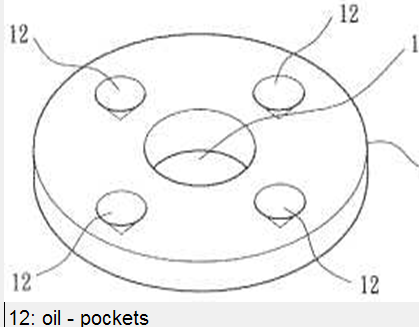 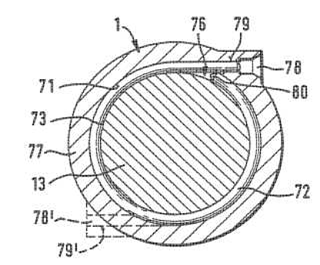 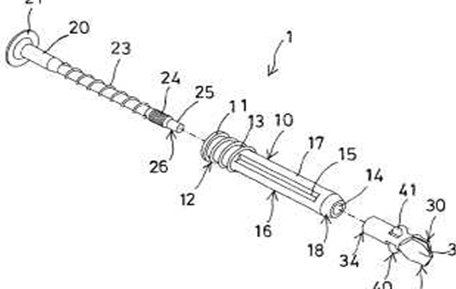 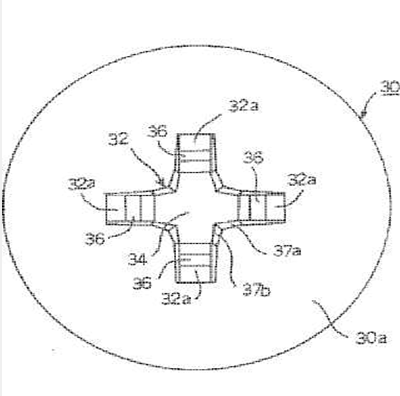 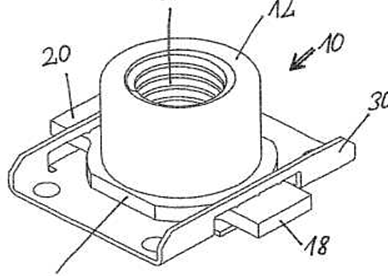 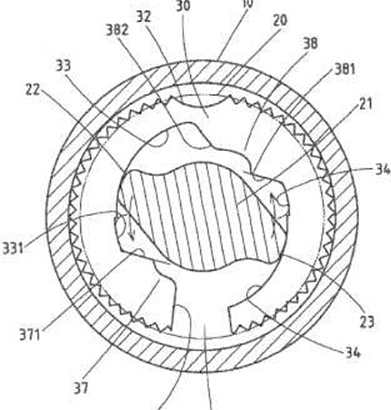 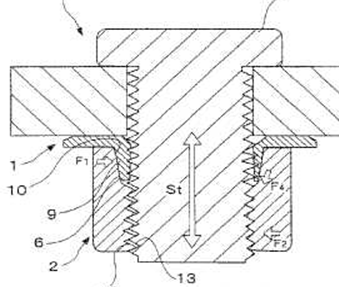 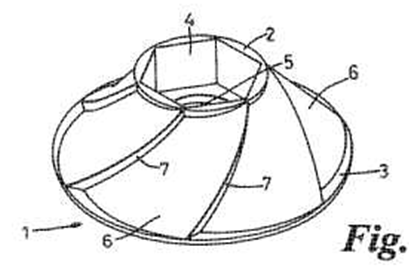 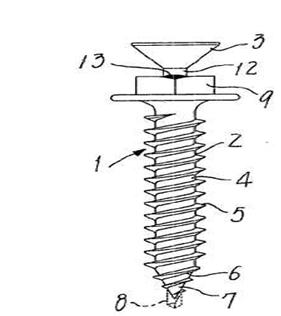 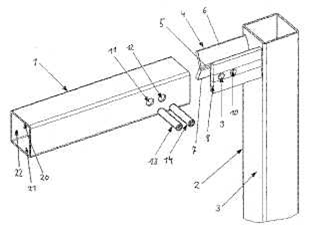 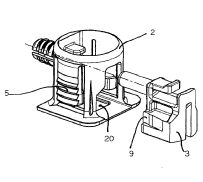 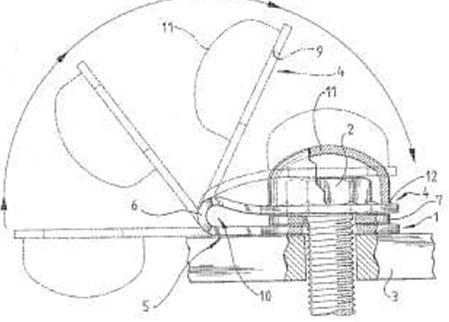 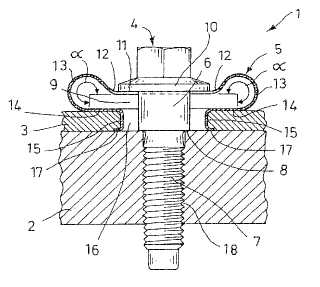 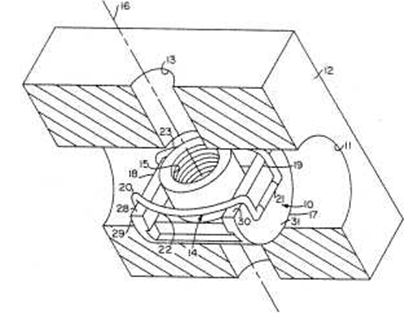 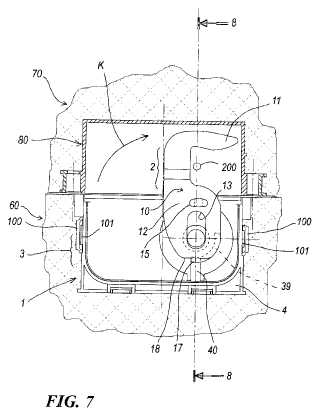 on the fastening element itself, a symbol for invention information should be given for the fastening element and a further symbol for additional information should be given for the connection and vice versa according the focus. 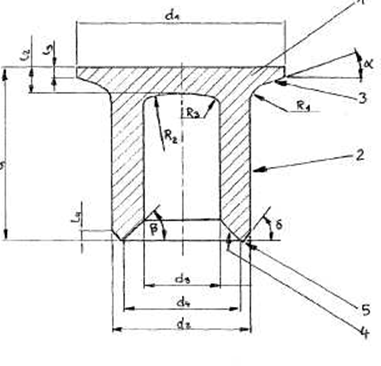 In this main group, it is desirable to add the indexing codes of F16B 2200/00. 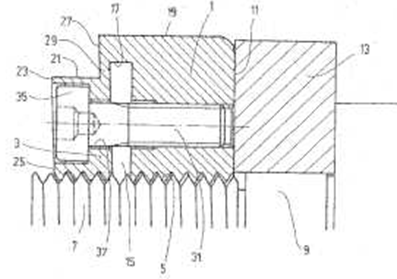 Securing devices making use of shape memory alloys, hydraulic or pneumatic action or securing devices with marking colours or the like. 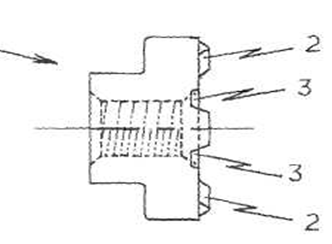 Groups F16B 2/00 - F16B 47/00 take precedence over group F16B 1/00. 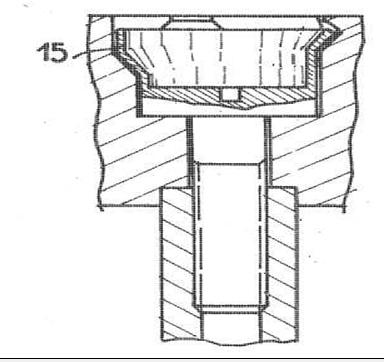 Group F16B 1/00 is residual. 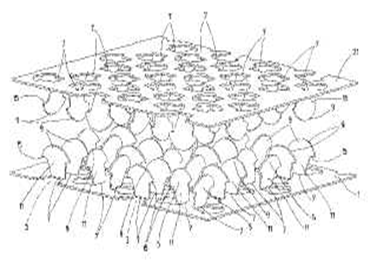 Illustrative example of subject matter classified in this group. 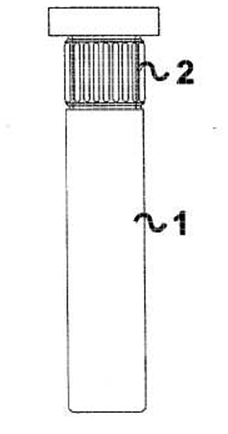 Group F16B 1/02 is residual. 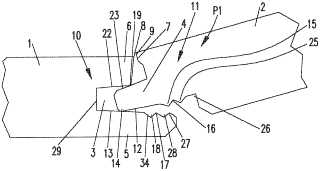 Groups F16B 2/00 - F16B 47/00 take precedence. 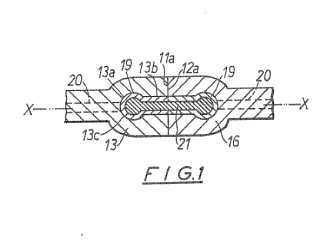 Group F16B 1/04 is residual. 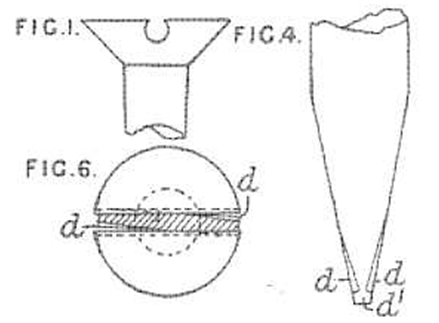 Groups F16B 2/00 - F16B 47/00 take precedence. 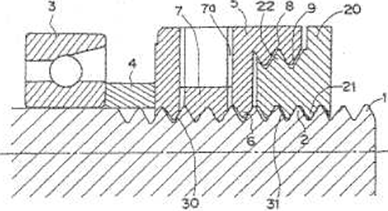 Connections by keys type elements. 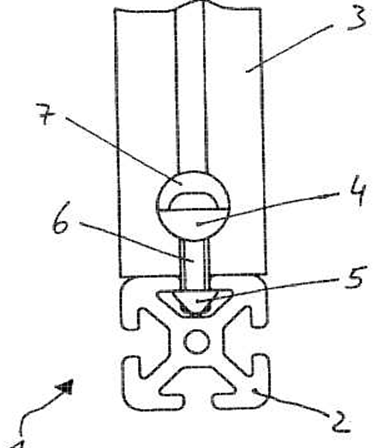 The key having a geometric shape that engaged to corresponding geometric shapes in the elements to be connected. 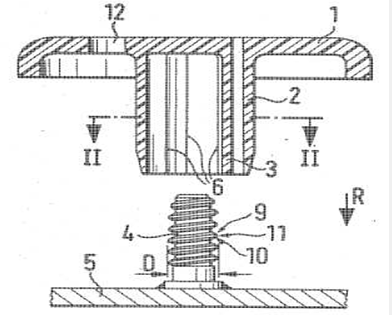 Shrinkage connections and force fits, i.e. 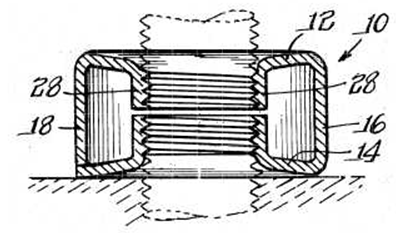 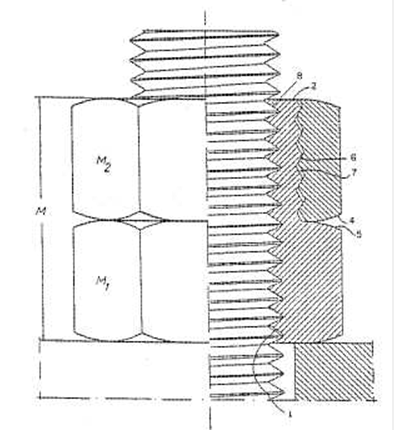 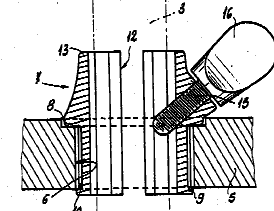 a fastening between two parts which is achieved by friction after the parts are pushed together rather than by any other means of fastening. 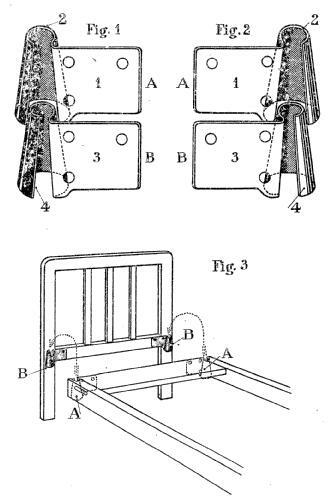 Joining of sheets and plates to one another or to strips and bars. 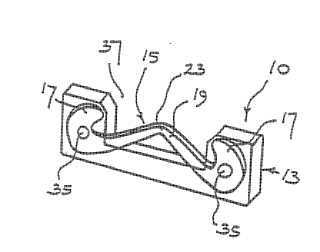 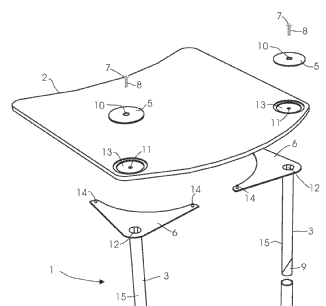 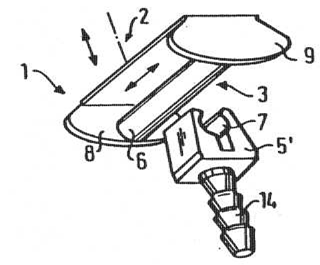 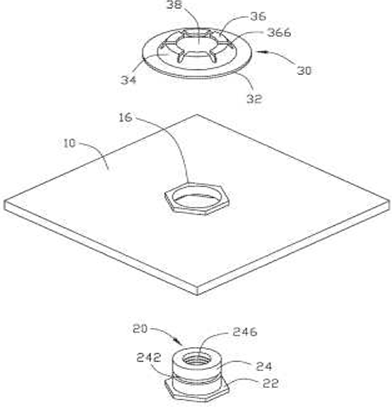 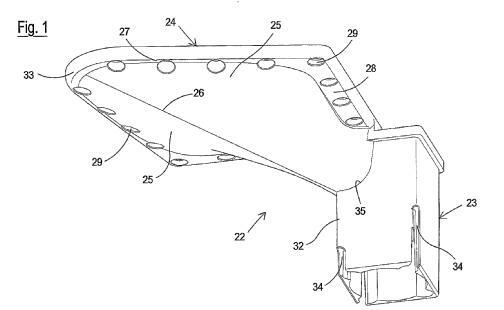 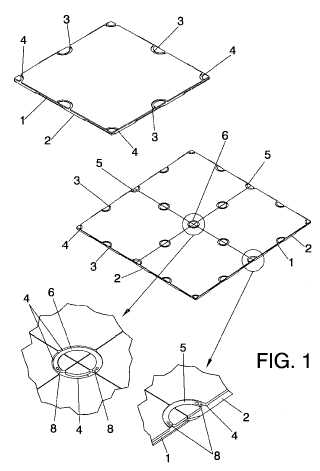 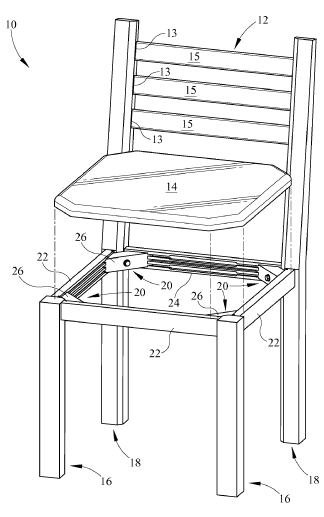 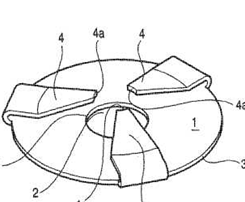 The focus lies on how the sheets or plates are connected and not on the fastening element itself. 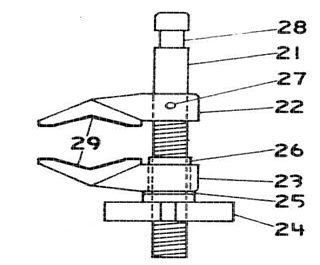 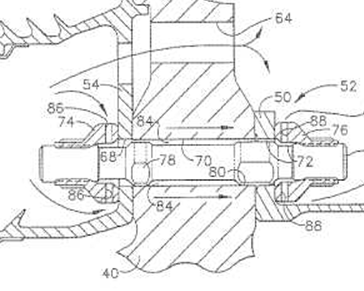 Generally at least two groups are attributed, one for the clamping or clipping connection and one for the fastening element itself. 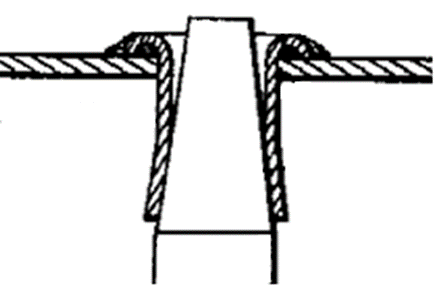 Connections of rods and tubes or profiles mutually by clamping, clipping or screwed connections. 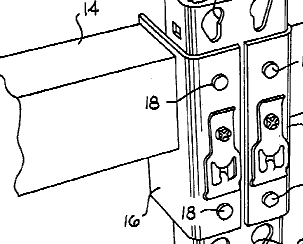 If connections relate to a specific application field, they should be generally classified in the application field. 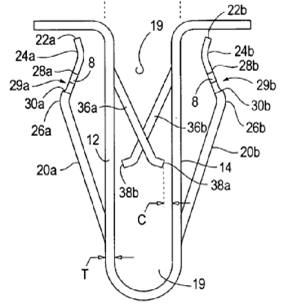 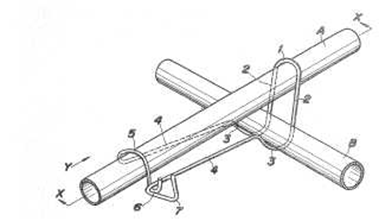 The class is directed towards connections of rods or tubes by turnbuckles. 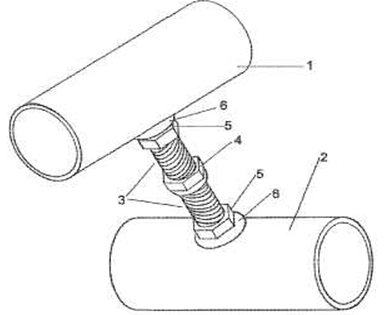 However, if it is unclear, whether the turnbuckle is for rods or tubes or not, the document should also be classified in this group. 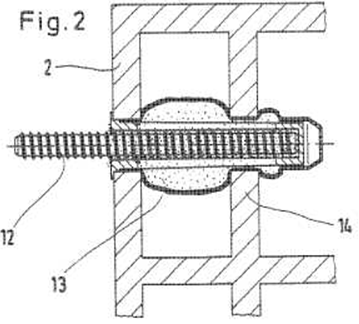 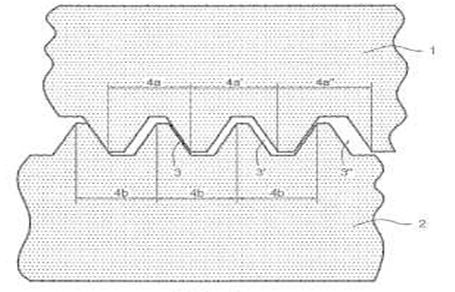 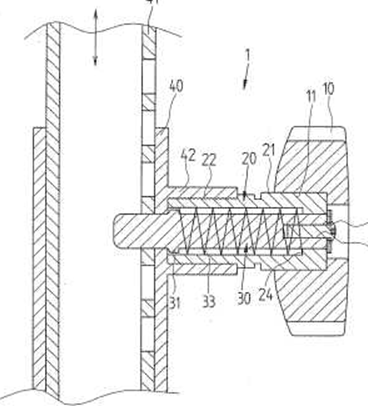 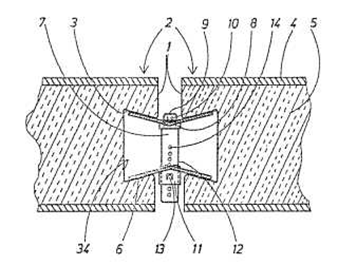 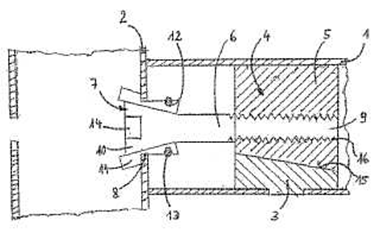 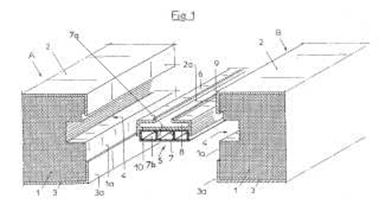 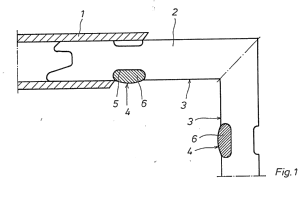 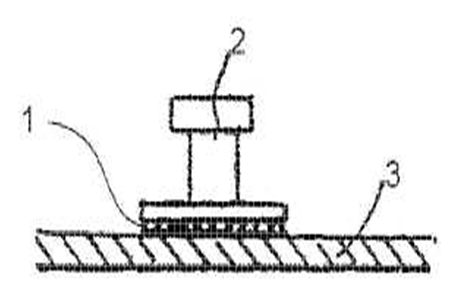 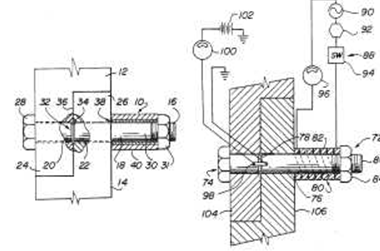 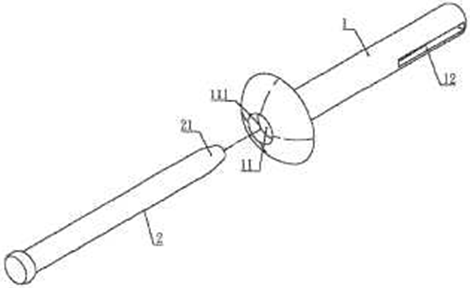 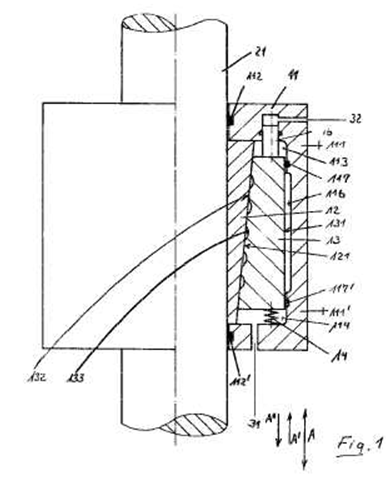 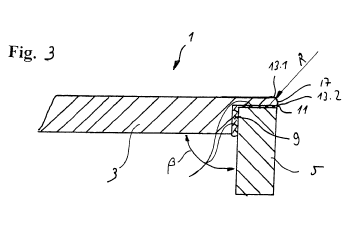 Non-torque transmitting connections of rods or tubular parts to flat surfaces at an angle, i.e. 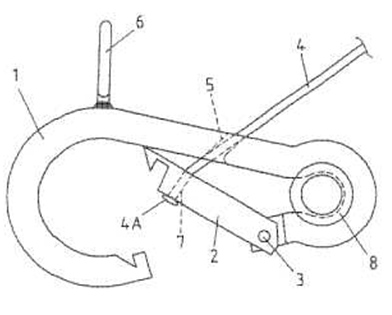 the rods or tubular parts are non-parallel with respect to the flat surfaces. 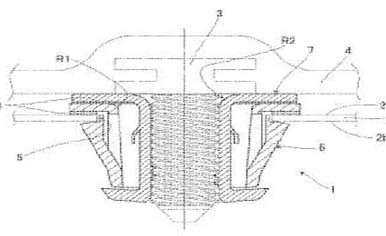 The rods or tubular parts can be connected perpendicularly to the flat surfaces. 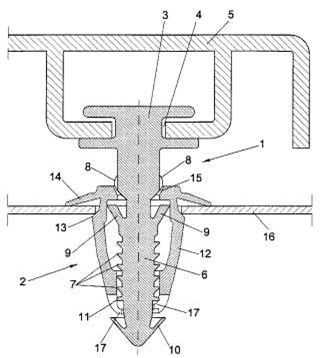 The connections can involve an intermediate member. 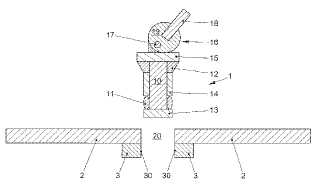 The rods or tubular parts and the flat surfaces are constructional elements or machine parts. 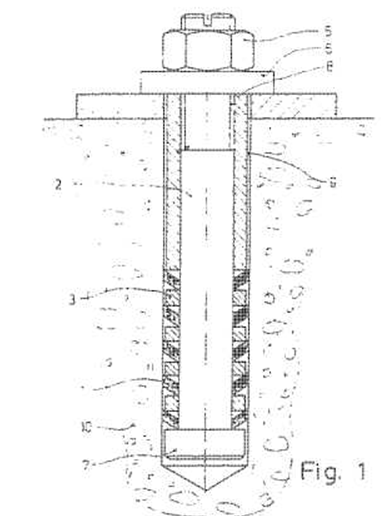 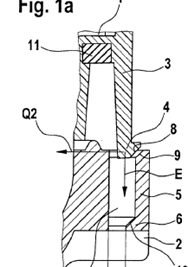 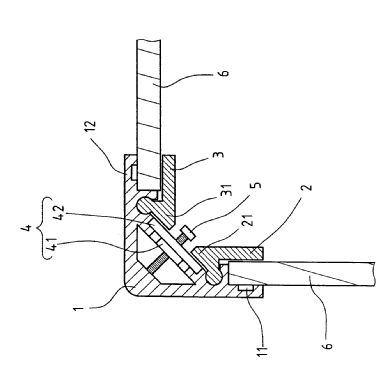 The rods or tubular parts are elongated elements, of any cross-section, that do not convey fluids. 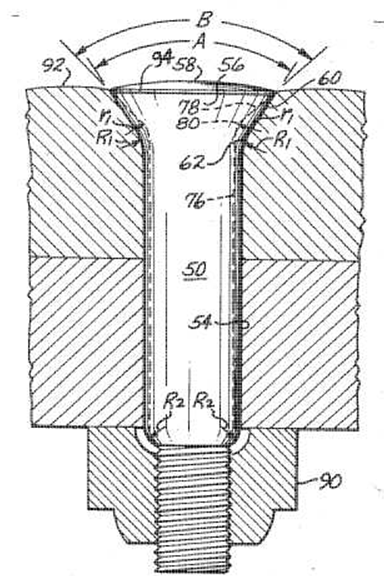 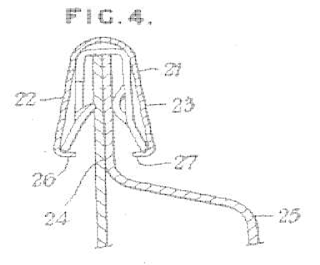 Rods or tubular elements may be flexible, but not flaccid, e.g. 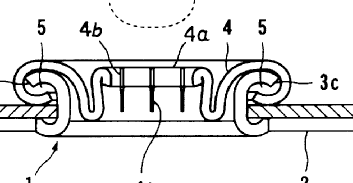 a cord is not a rod or tubular element in the sense of F16B 9/00. 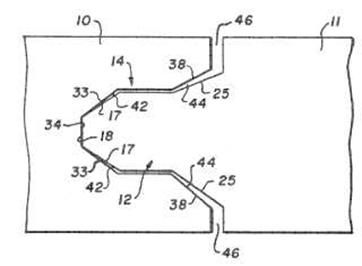 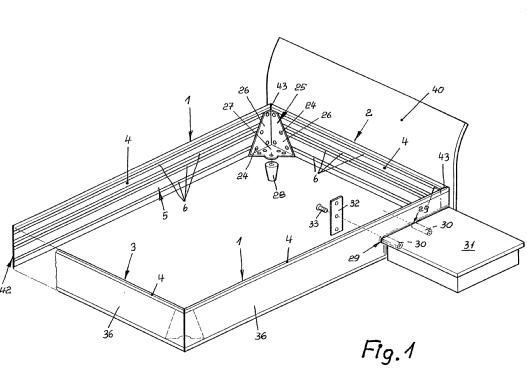 Flat surfaces are surfaces that are planar at least locally around the connection location. 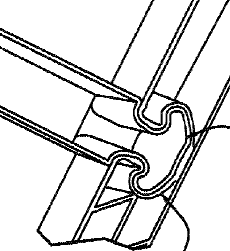 Connections of rods to rods are classified in F16B 7/00 and subgroups. 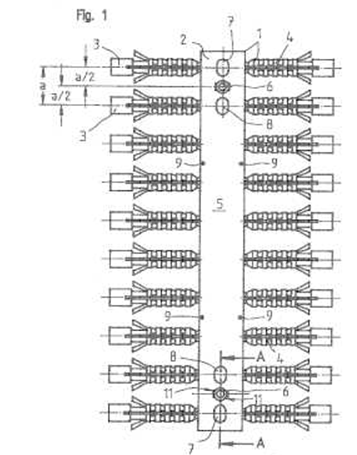 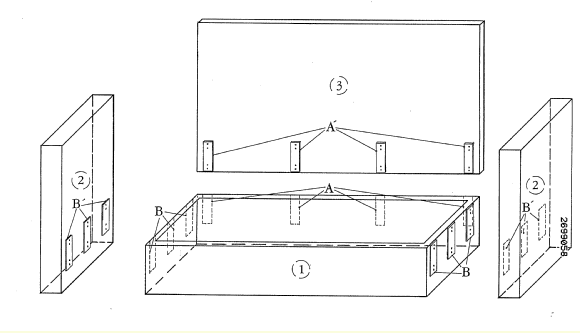 Connections of rods parallel to flat surfaces are classified in F16B 5/00 and subgroups. 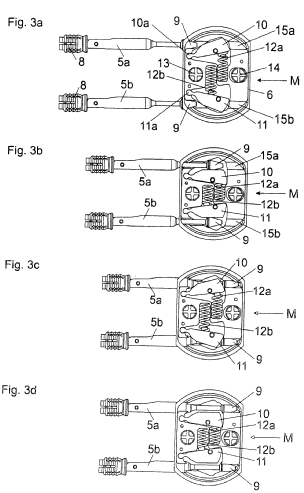 Connections of cables or cords to other objects are classified in F16G 11/00 and subgroups. 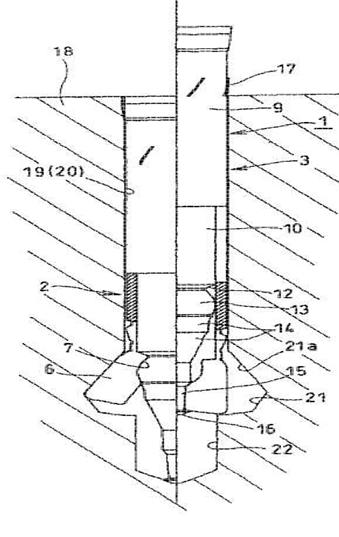 References F16B 2/00, B23P 11/00, B23P 19/00, F16L, F16L 41/00 are non-limiting in the main group F16B 9/00. 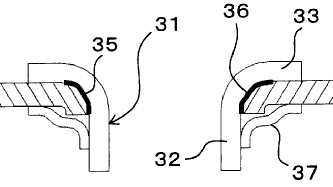 CPC will be updated/corrected once this inconsistency is resolved. 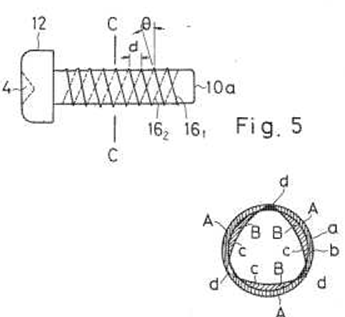 Connections that can be detached without breaking any part. 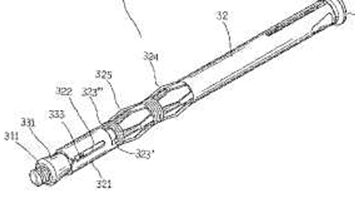 Detachable and releasable are synonyms. 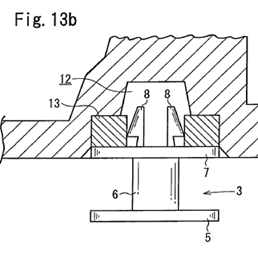 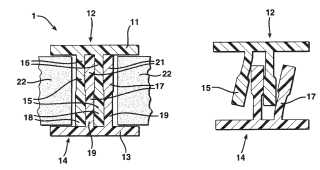 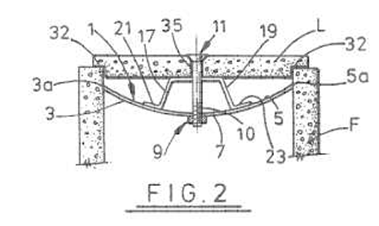 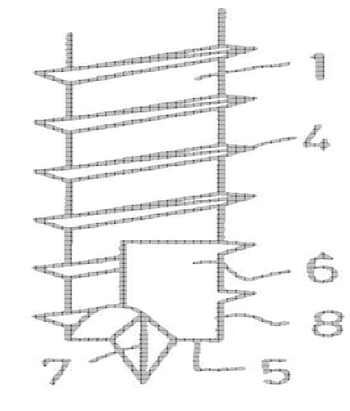 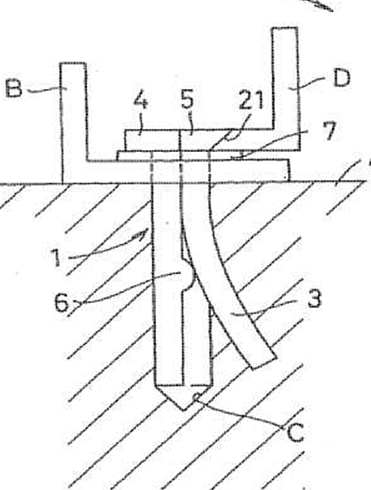 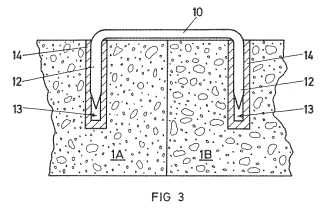 Connections of constructional elements by glueing, cold pressure welding and by plastically deforming the elements. 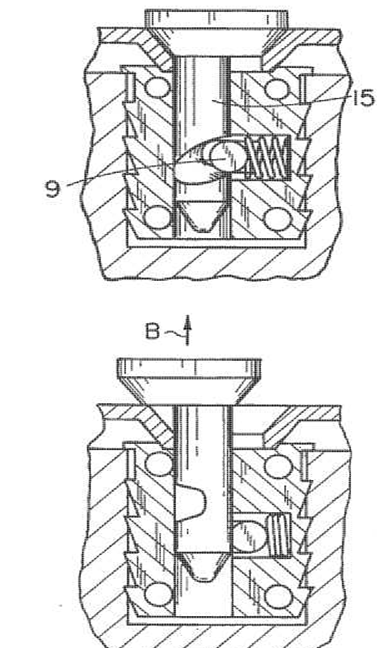 Illustrative example of subject matter classified in this group (DE20307683U). 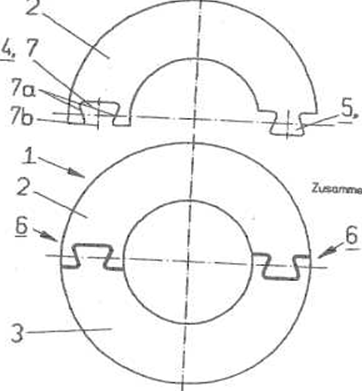 Illustrative example of subject matter classified in this group (DE102004016551). 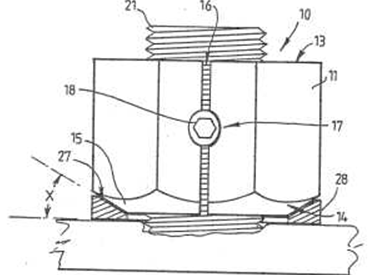 Illustrative example of subject matter classified in this group (US2010322740). 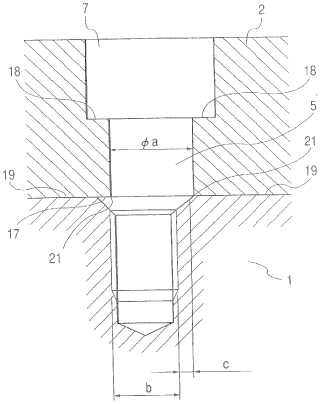 Illustrative example of subject matter classified in this group (EP1530926). 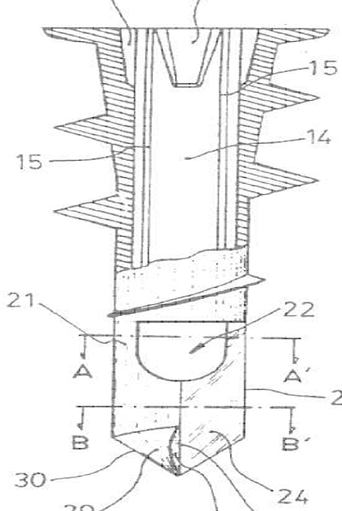 Illustrative example of subject matter classified in this group (FR2927677). 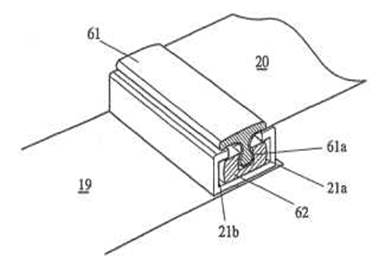 Illustrative example of subject matter classified in this group (US2010202852). 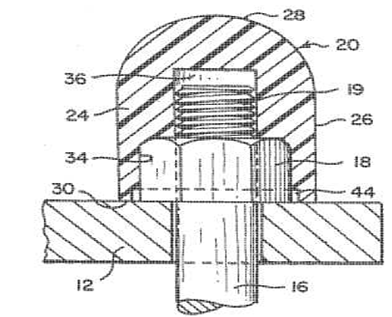 Illustrative example of subject matter classified in this group (US4990020). 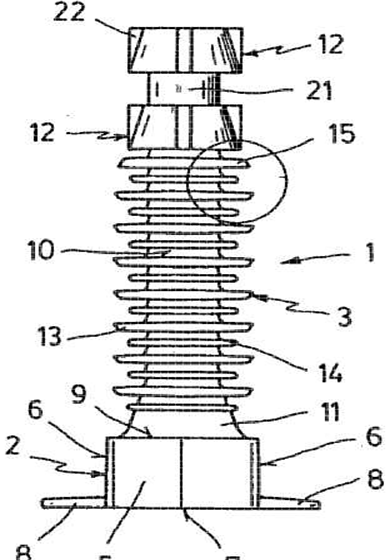 Illustrative example of subject matter classified in this group (US2010258039). 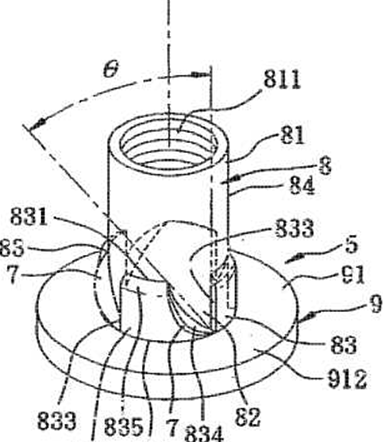 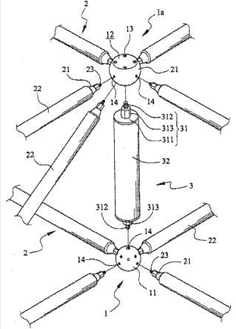 Illustrative example of subject matter classified in this group (US917433). 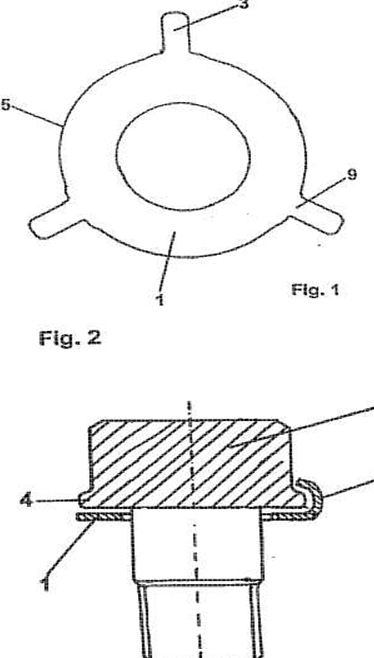 Illustrative example of subject matter classified in this group (DE202009014811U). 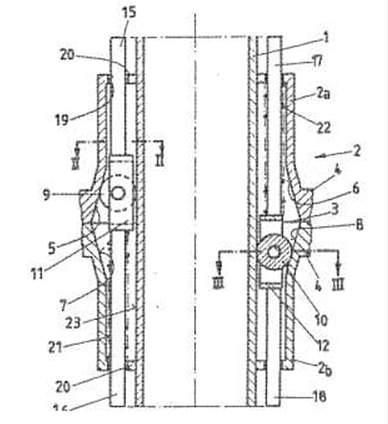 Illustrative example of subject matter classified in this group (DE10336968). 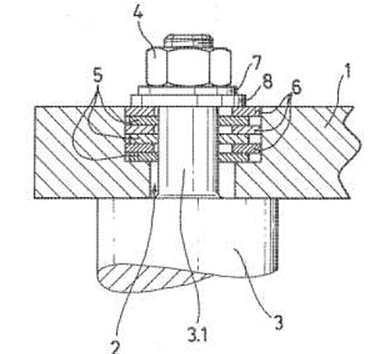 Illustrative example of subject matter classified in this group (DE202009012657U). 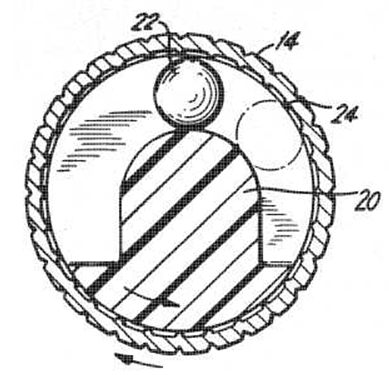 Illustrative example of subject matter classified in this group (US2002153340). 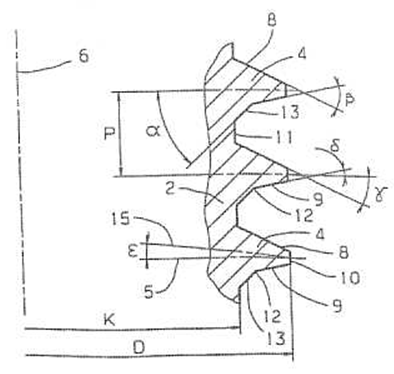 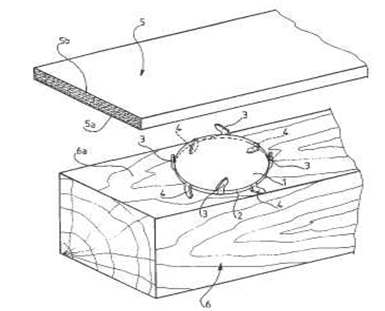 Illustrative example of subject matter classified in this group (EP1508705). 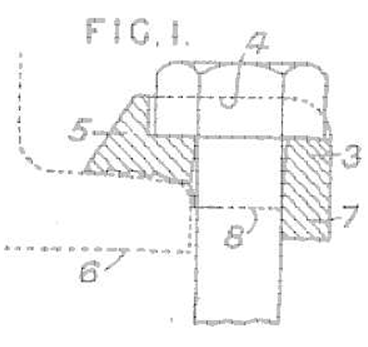 Illustrative example of subject matter classified in this group (US2001044992). 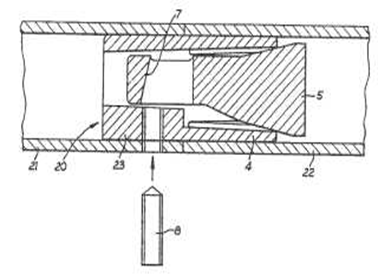 Illustrative example of subject matter classified in this group (FR1520757). 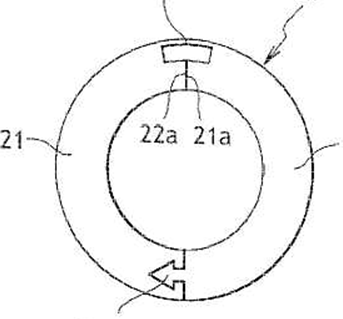 Illustrative example of subject matter classified in this group (US2011225802). 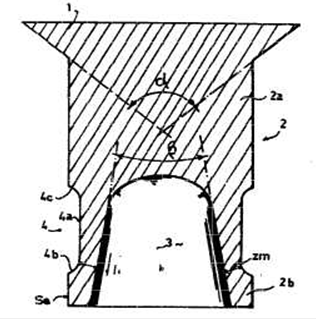 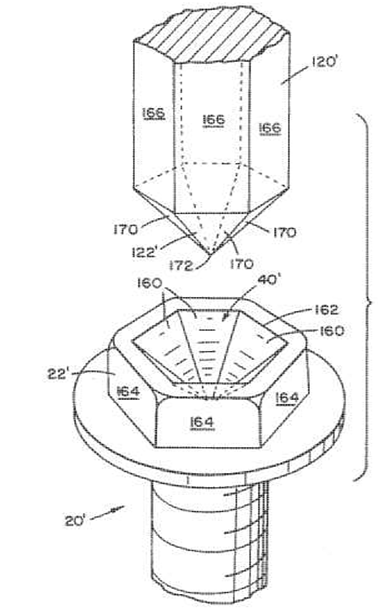 Illustrative examples of subject matter classified in this group (DE202006014679U, US7677830). 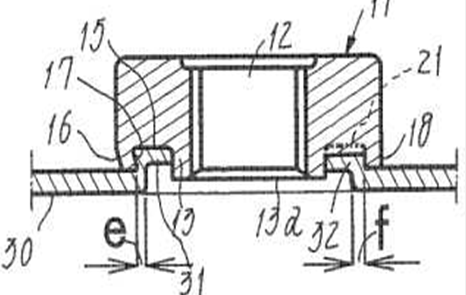 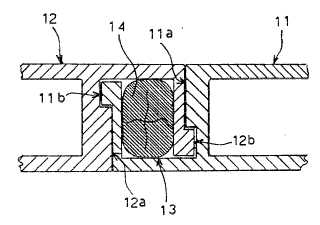 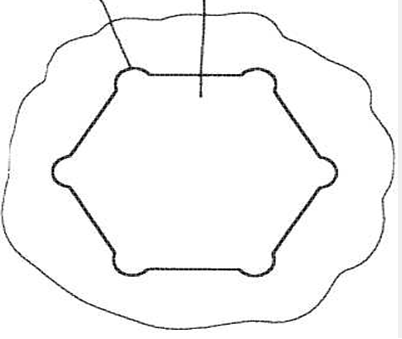 This sub-group concerns joints between two or more NON-METAL connecting elements whose connector or liaison part is non-metal or metallic. 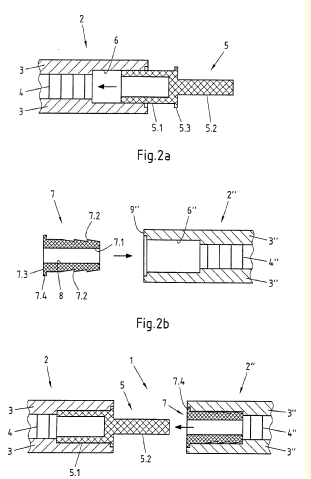 Illustrative example of subject matter classified in this group (DE202009017363U, DE202010017070). 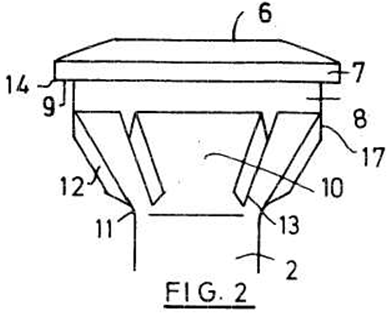 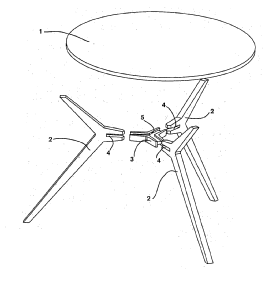 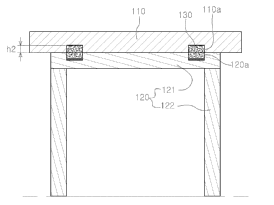 This sub-group concerns joints between two or more NON-METAL leg connecting elements whose connector or liaison part is non-metal or metal and includes the connection between table top or similar and leg(s). 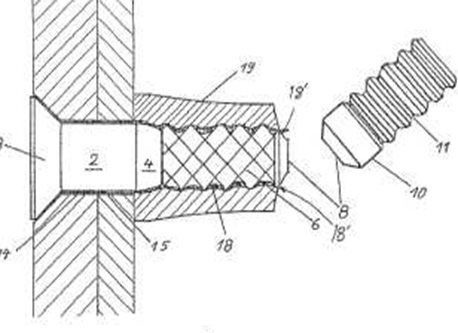 This sub-group concerns joints between two or more METAL connecting elements whose connector or liaison part is non-metal or metal. 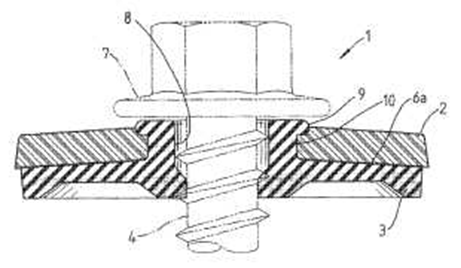 This sub-group concerns joints between two or more METAL leg connecting elements whose connector or liaison part is non-metal or metal and includes connections between table top or similar and leg(s). 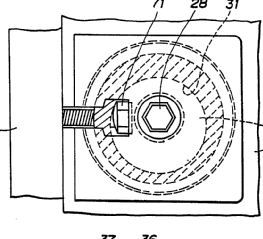 Illustrative example of subject matter classified in this group (US2006195983). 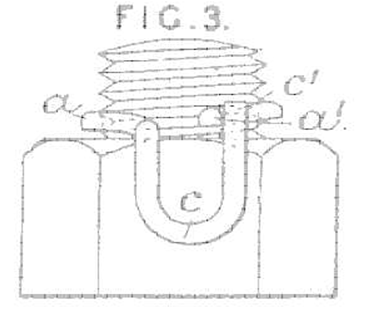 Illustrative example of subject matter classified in this group (FR875988, US3539211). 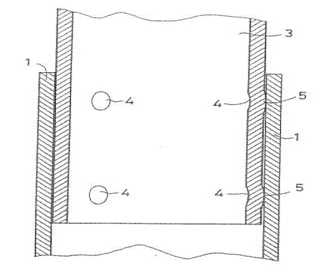 Illustrative example of subject matter classified in this group (FR2699058). 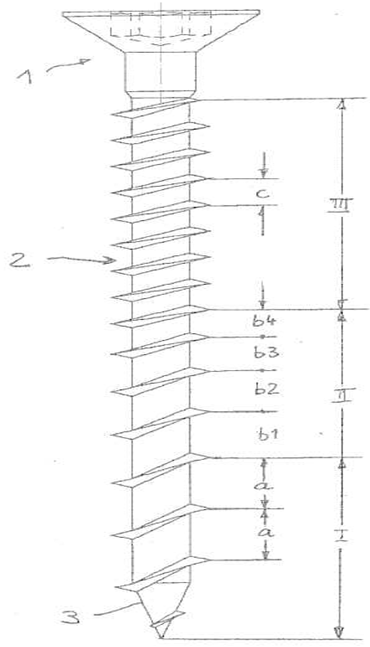 Dowels made e.g. 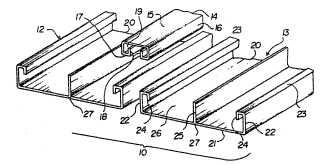 of wood, metal or plastic. 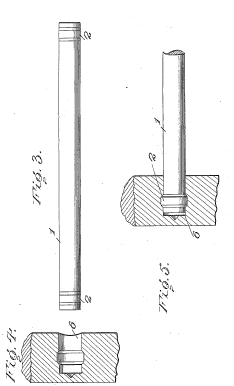 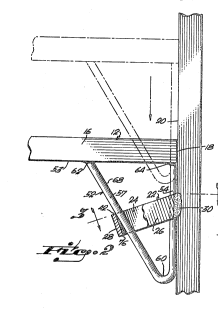 Dowels in form of a solid rod. 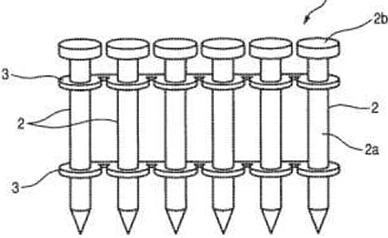 Dowels having parts gripping it the hole, e.g. 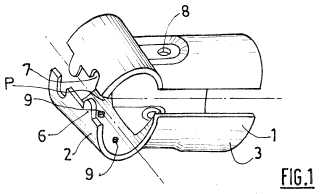 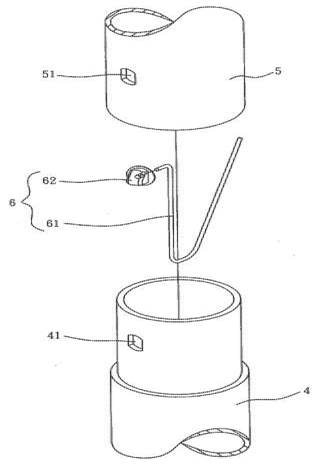 expanding sleeves or toggle mechanisms. 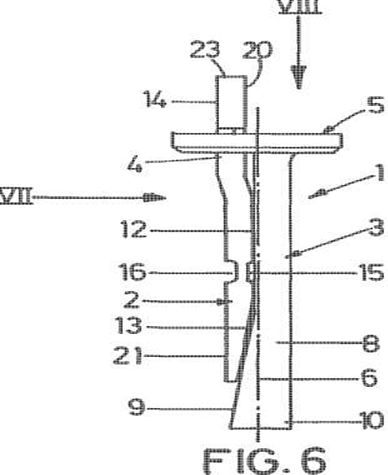 Dowels fastened by inserted an additional element. 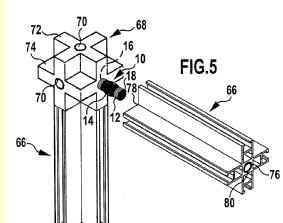 Dowels fixed by a settable material. 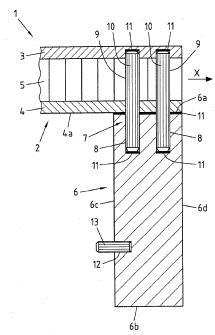 Solid cylindrical rod, usually made of wood, plastic or metal that is usually inserted into a blind hole. 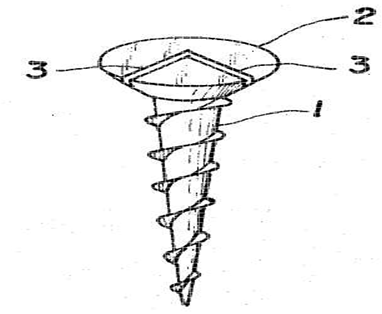 Staples, i.e. 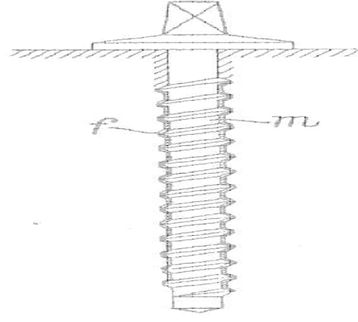 two pronged fasteners made of metal. 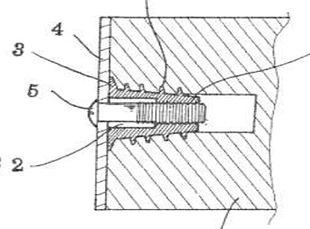 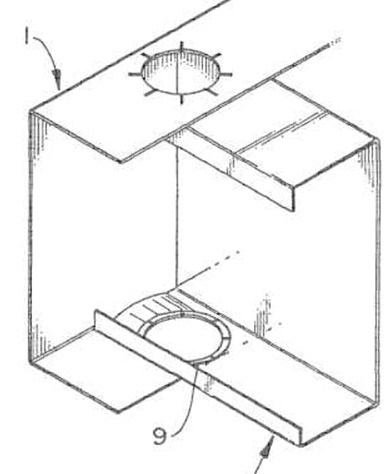 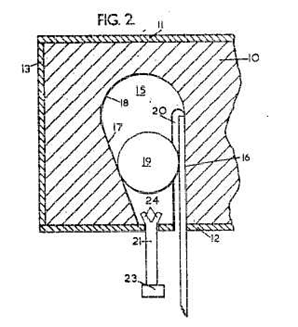 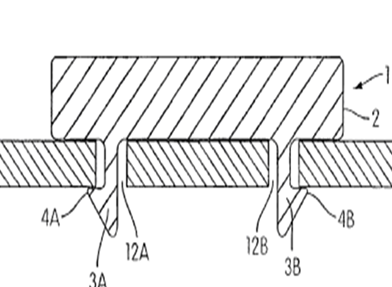 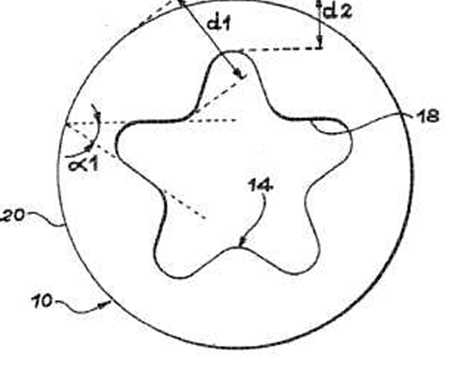 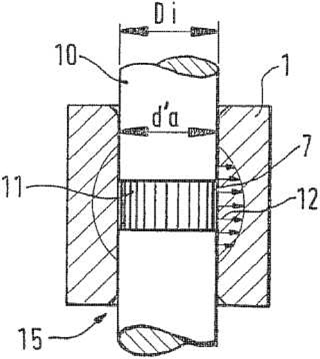 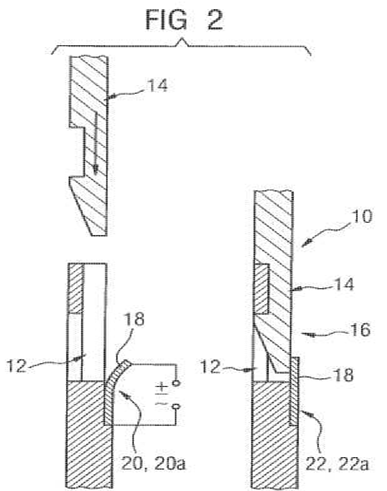 Non-releasable connections of one element by entering a hole in a second element and subsequent plastic deformation. 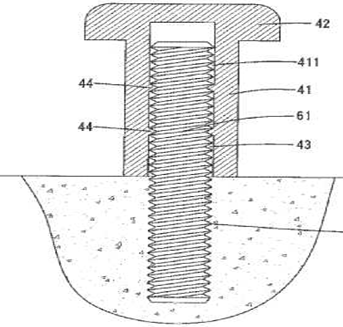 Bolts without screw-thread, pins and rivets, such as solid rivets or blind rivets. 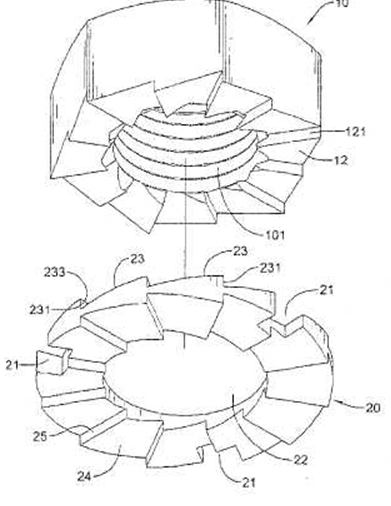 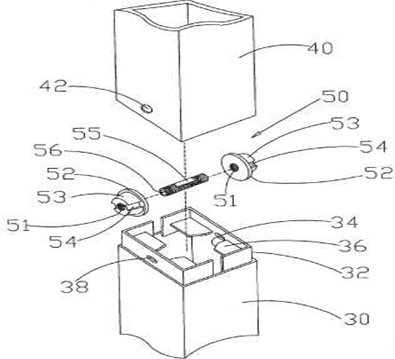 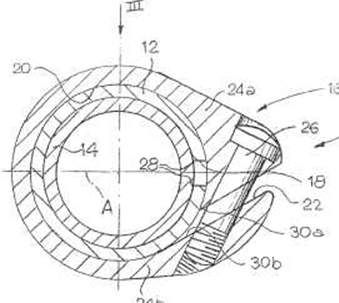 - Means for preventing axial movement of a pin or the like by rotation, snap in features, engagement in a keyhole slot, separate parts, such as circlips and other locking members. 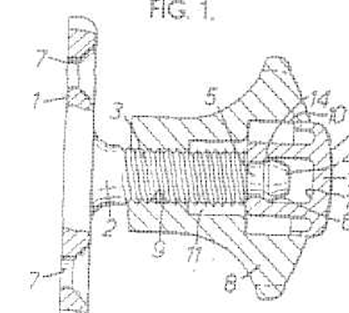 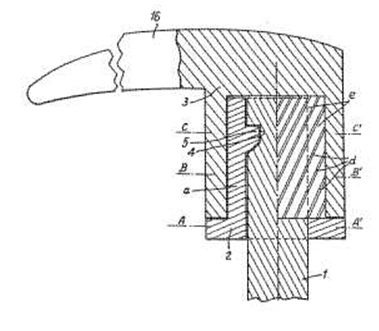 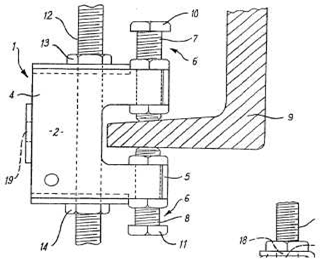 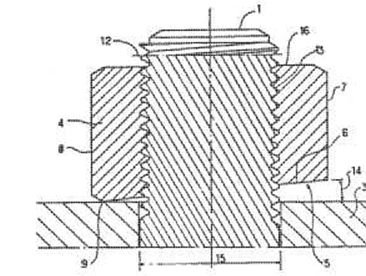 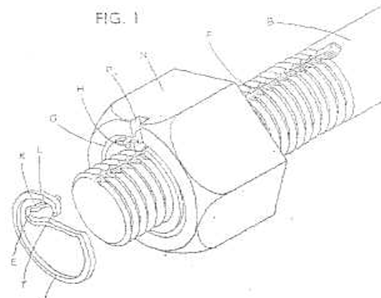 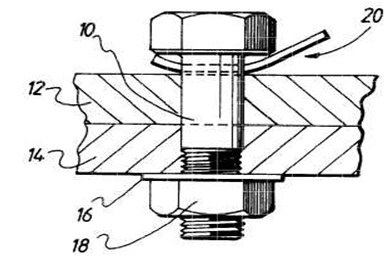 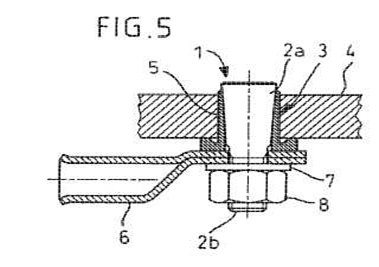 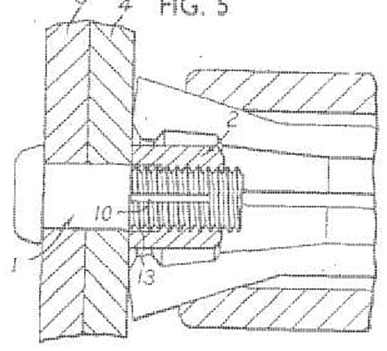 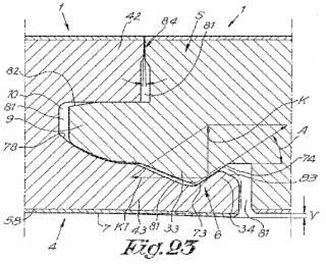 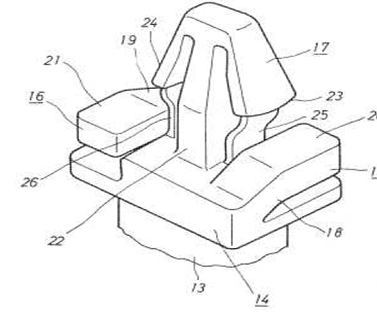 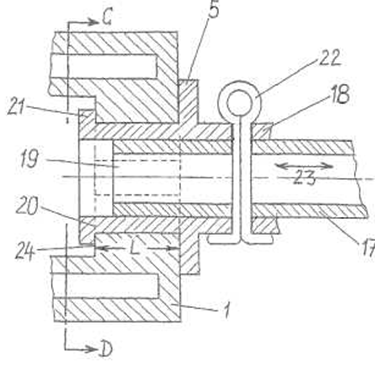 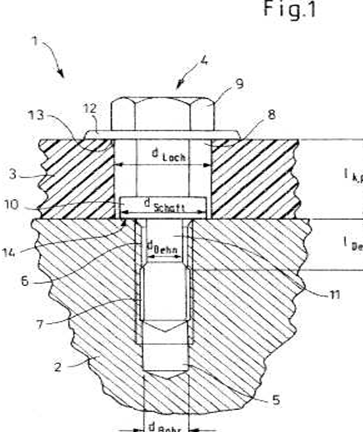 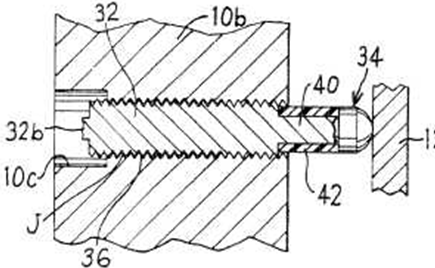 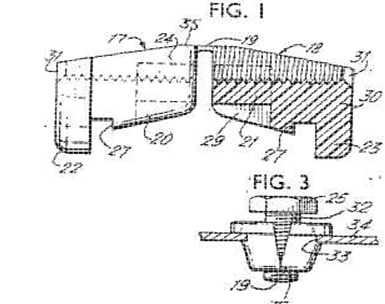 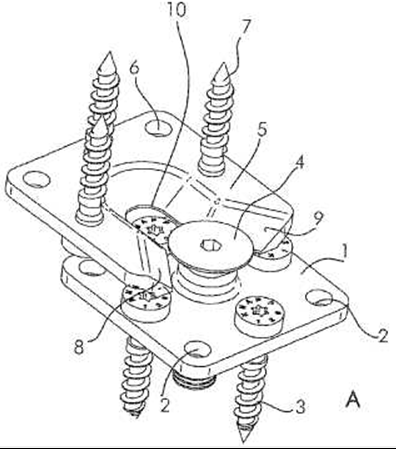 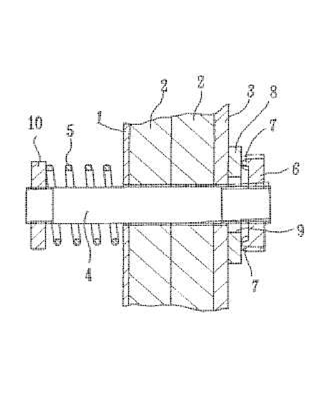 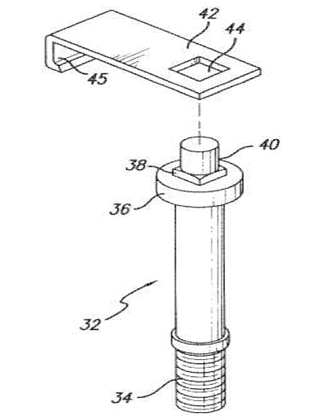 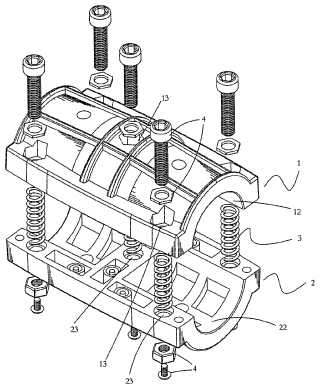 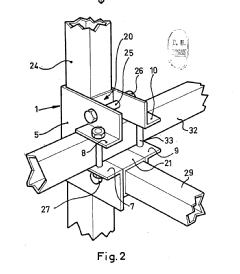 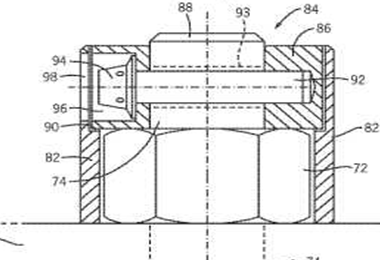 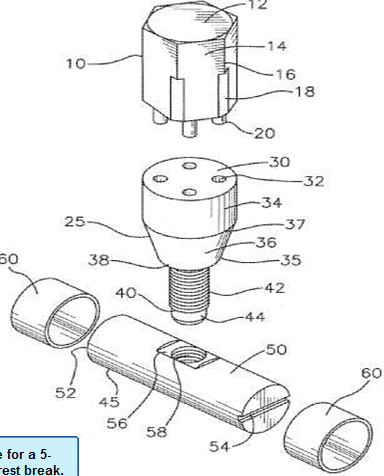 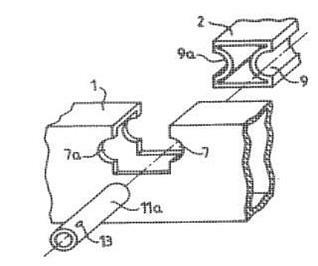 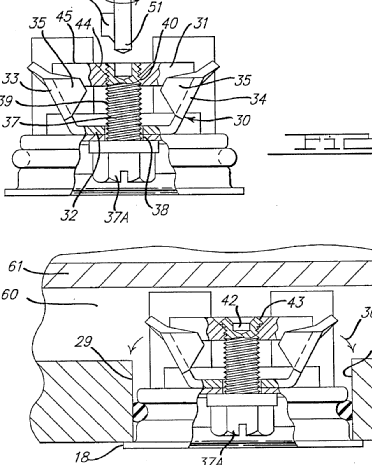 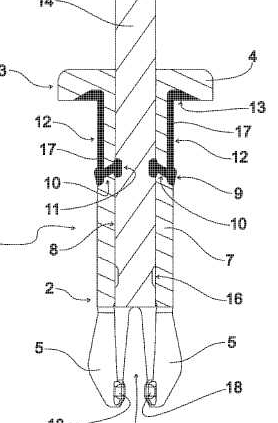 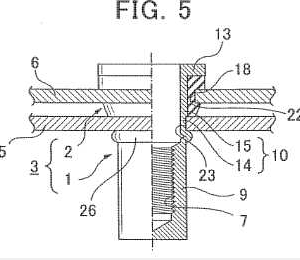 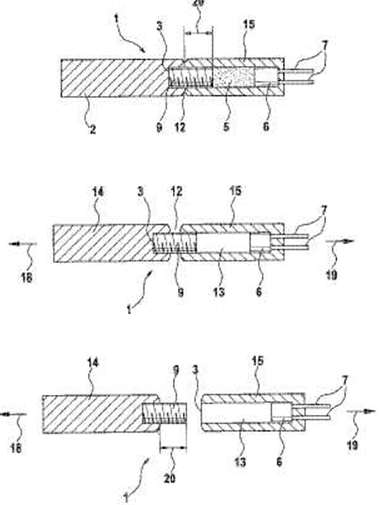 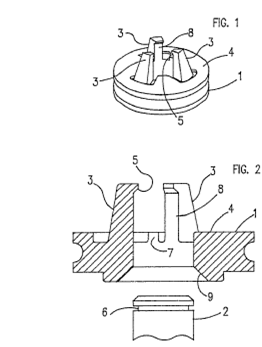 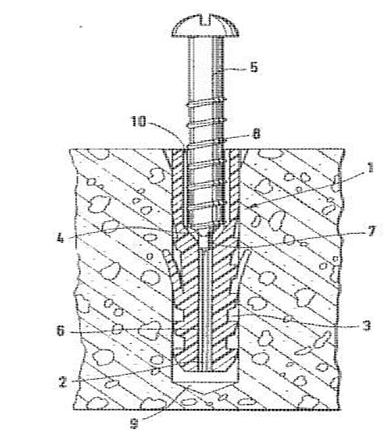 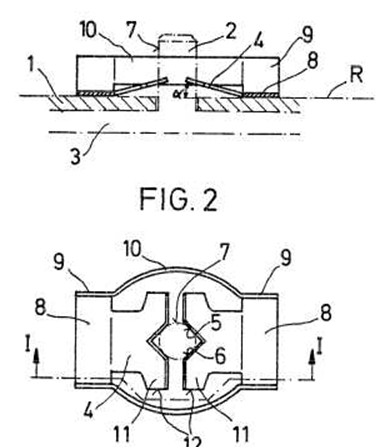 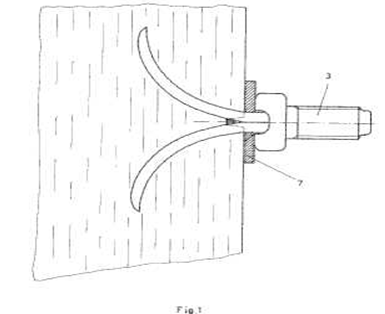 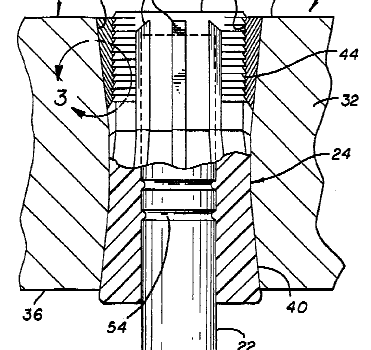 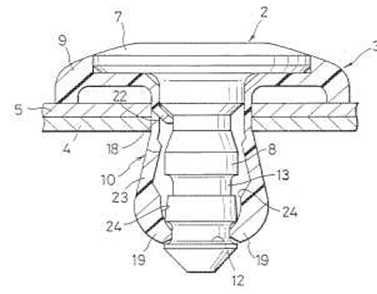 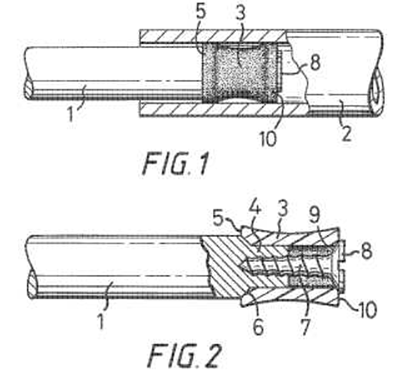 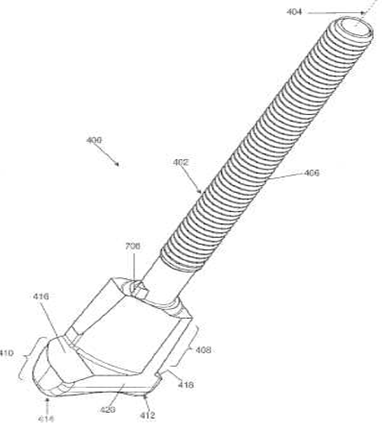 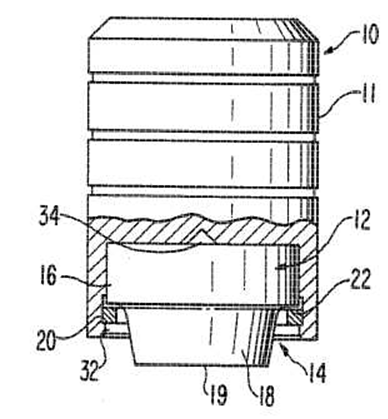 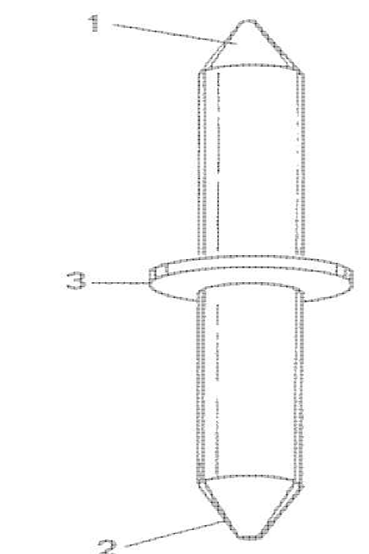 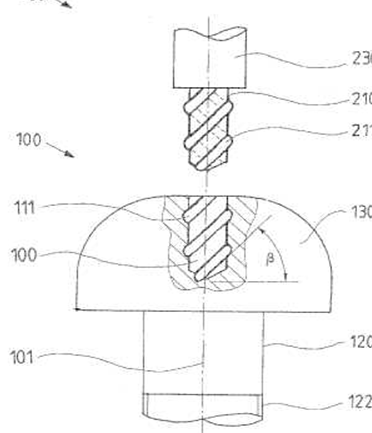 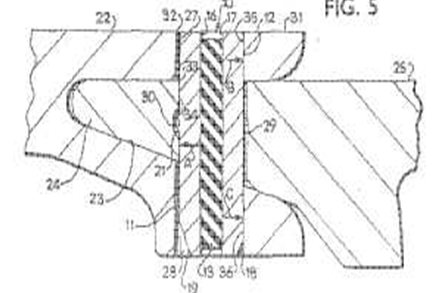 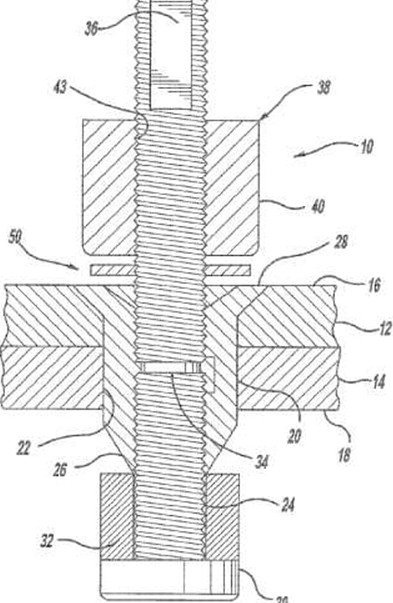 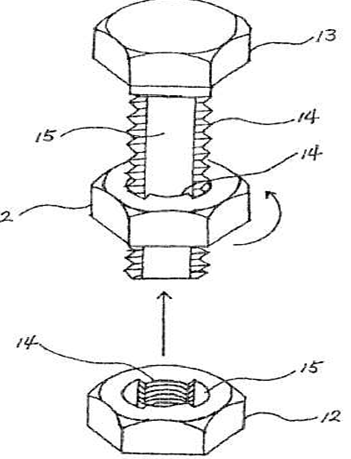 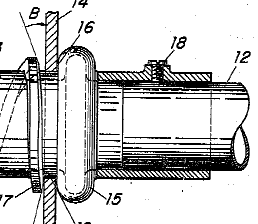 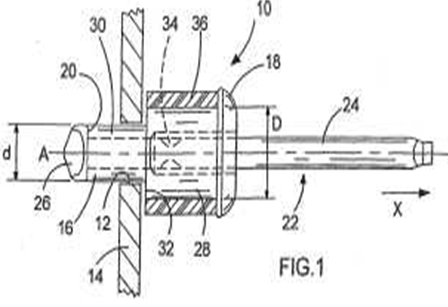 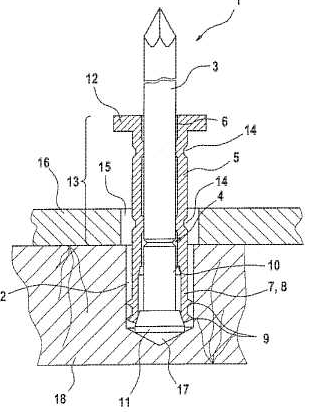 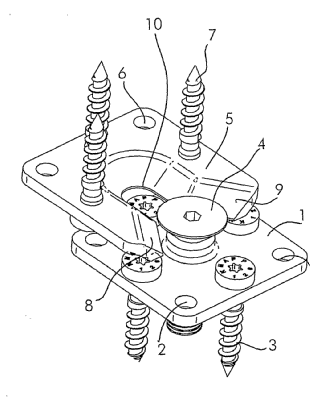 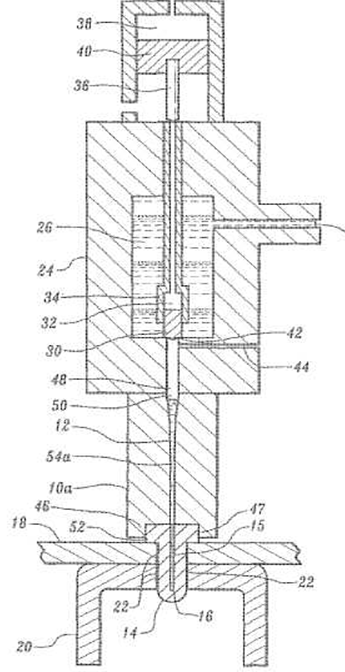 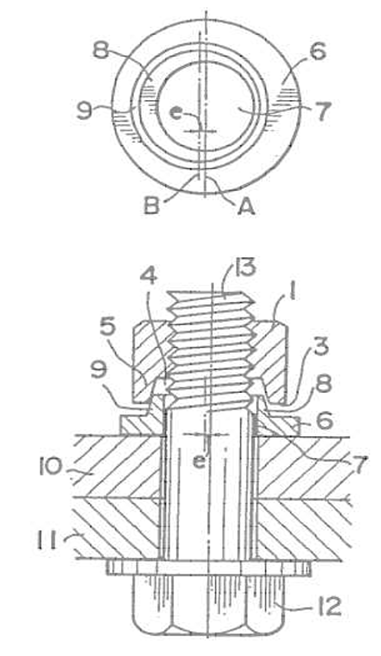 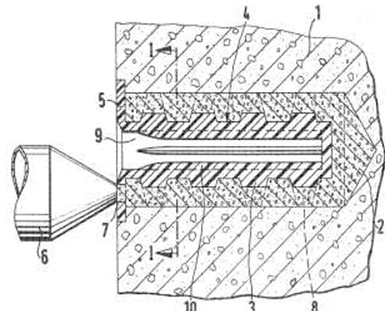 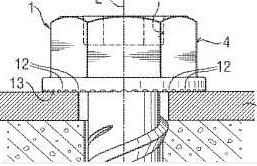 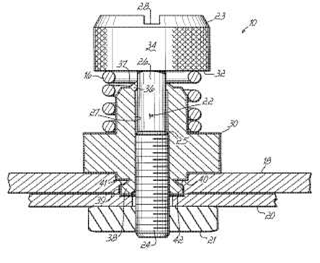 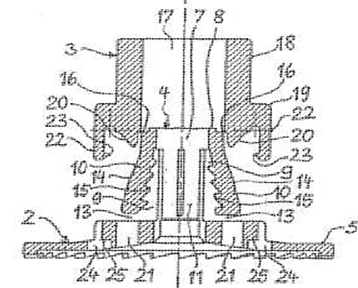 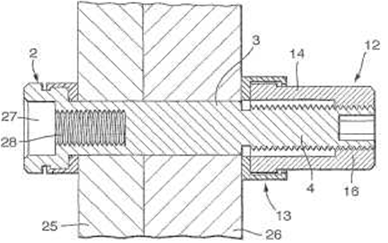 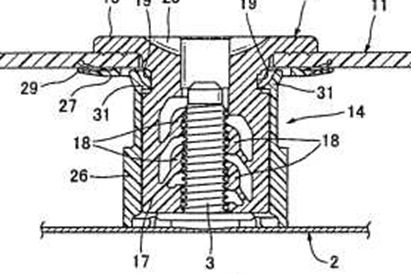 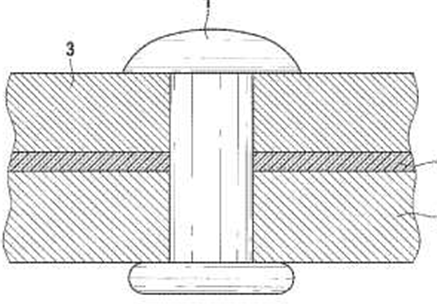 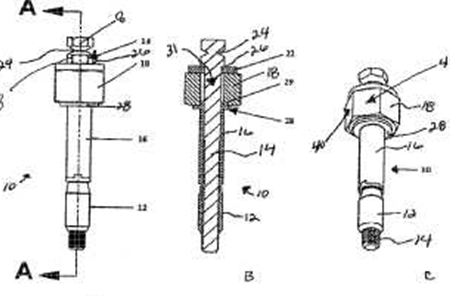 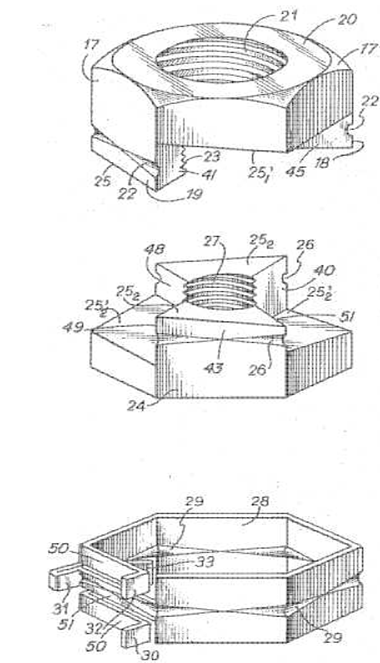 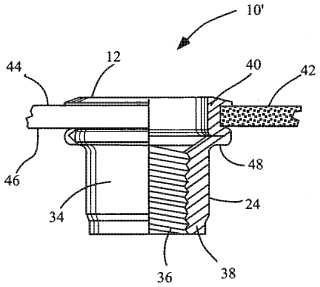 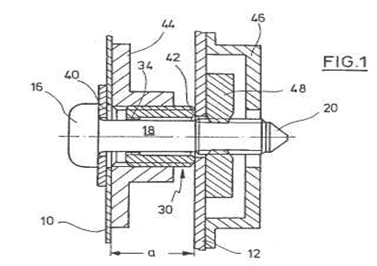 - Releasable stud-and-socket connections where the stud or the socket or both parts being resilient. 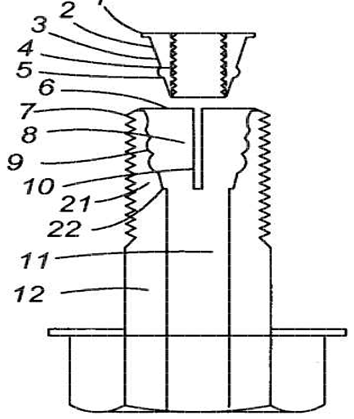 Self tapping or self-cutting screws used for securing constructional elements or machine parts together. 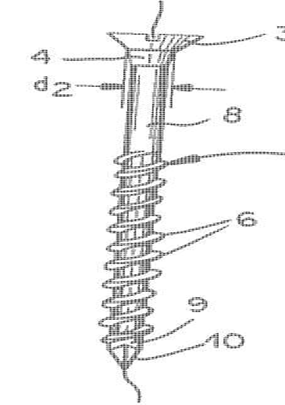 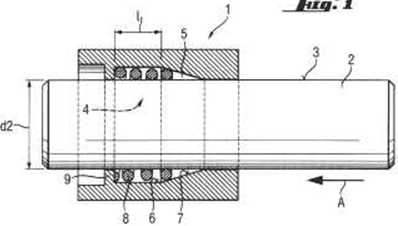 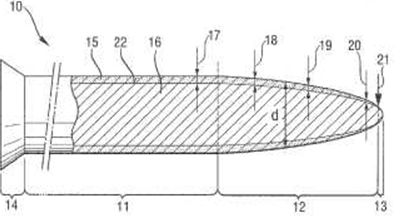 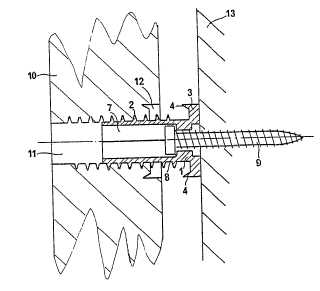 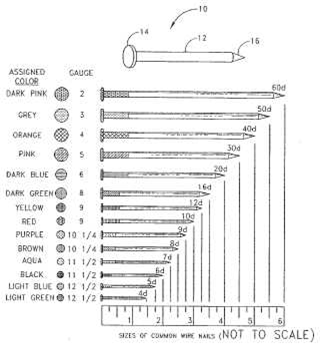 For self cutting screws at least one classification in F16B 25/00 should be attributed. 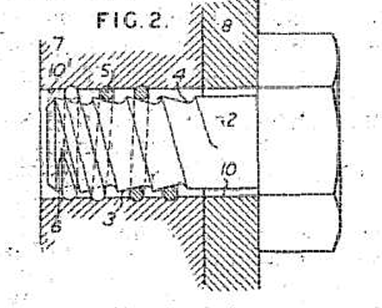 Several classes in F16B 25/00 in the inventive information field are generally to be attributed. 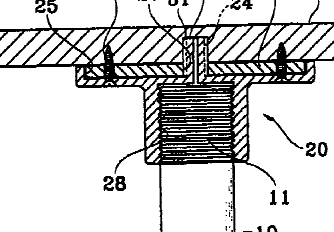 No additional classification should be attributed in F16B 35/00, except for F16B 35/06 and F16B 35/065. 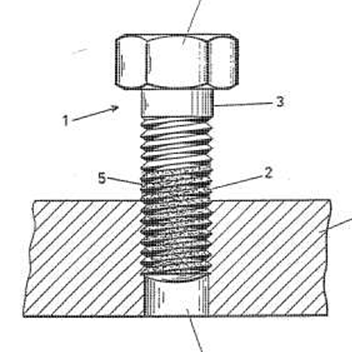 Features of fastening members with thread that are common to bolt and nut. 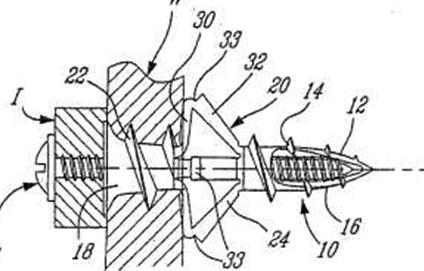 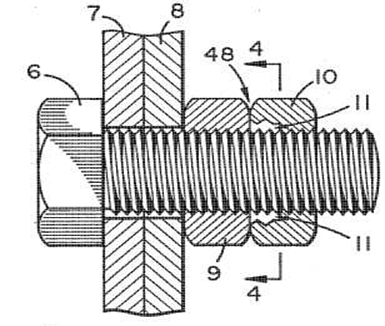 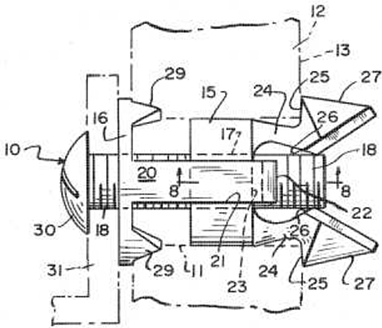 Thread cutting screws are classified in F16B 25/00. 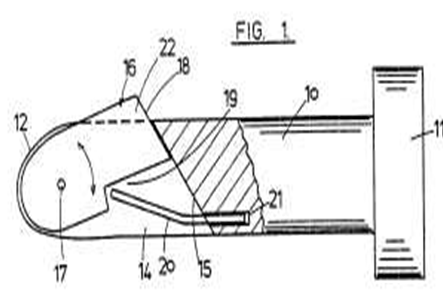 An additional entry can be attributed in F16B 35/06. 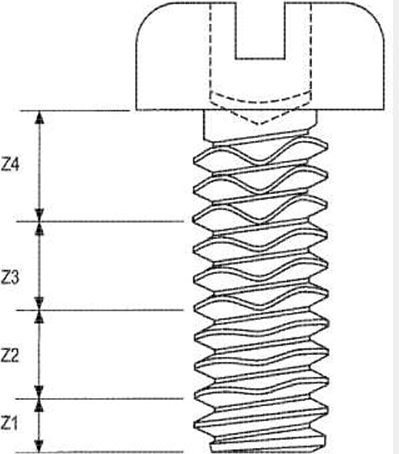 Self threaded screws with specially shaped heads are also classified in this group. 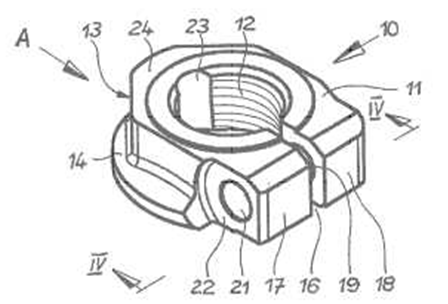 Nuts, i.e. 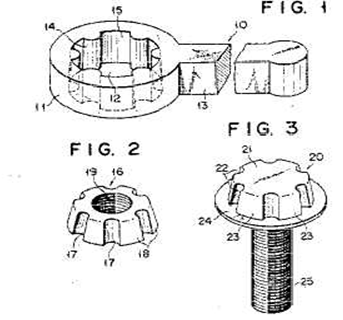 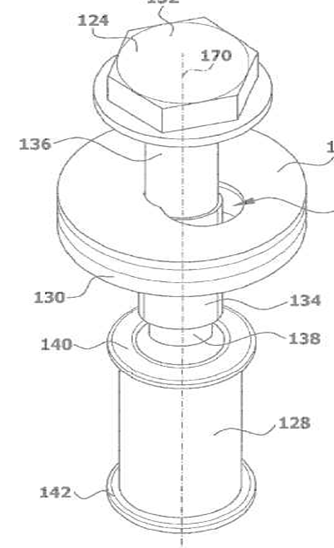 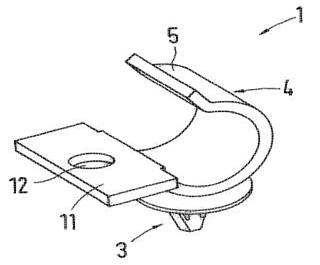 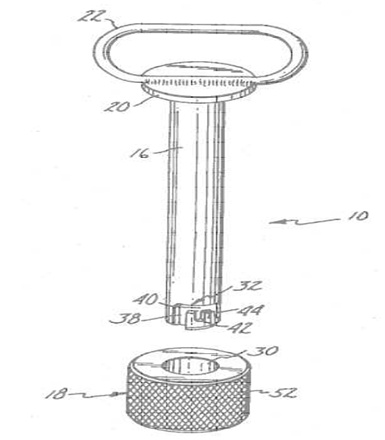 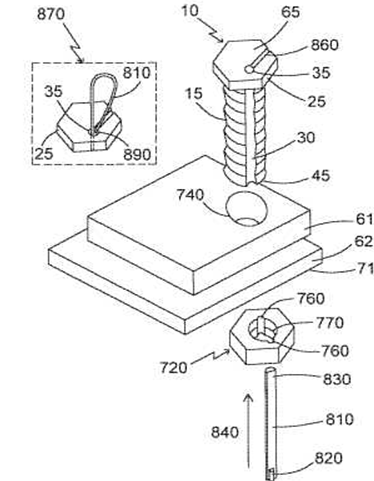 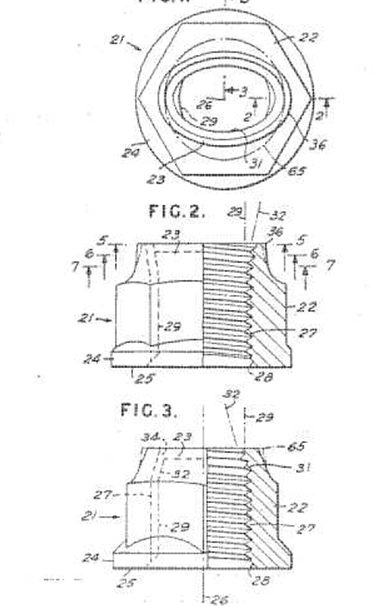 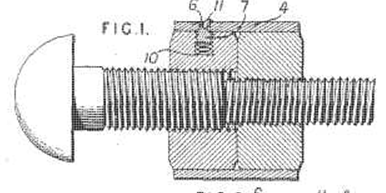 fasteners with a threaded hole. 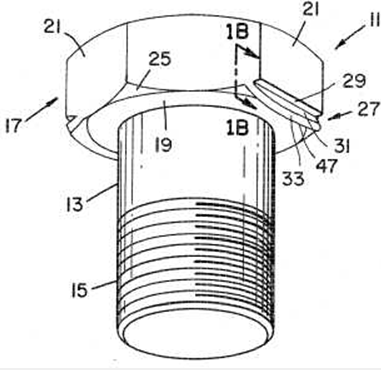 Groups F16B 37/04 comprise also threaded studs that are fastened to a surface. 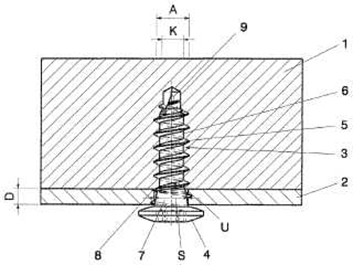 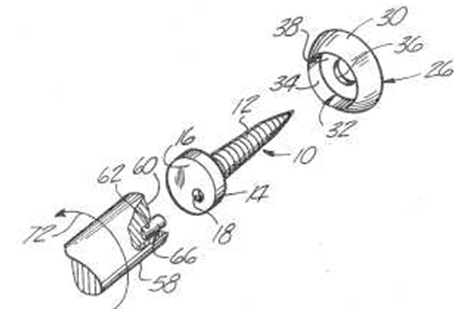 Locking of screws by means of a settable material, plastic deformation, geometric engagement or friction. 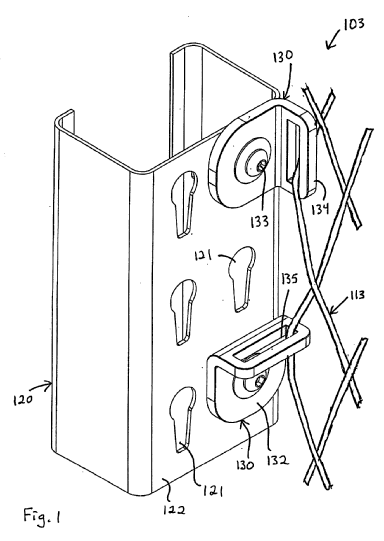 Washers or equivalent devices, i.e. 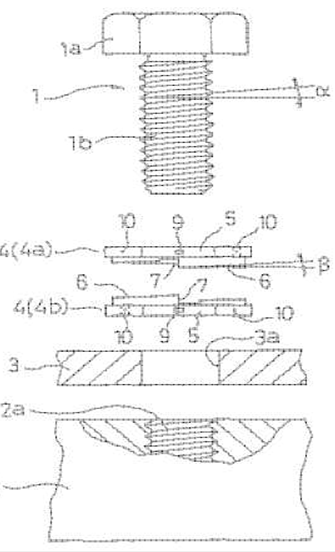 is a thin, typically disk shaped, plates with a hole that is used to distribute the load of a threaded fastener, such as a screw or a nut. 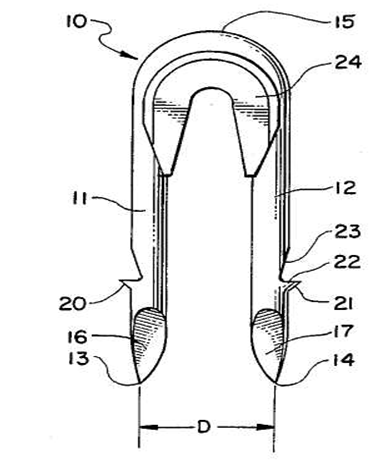 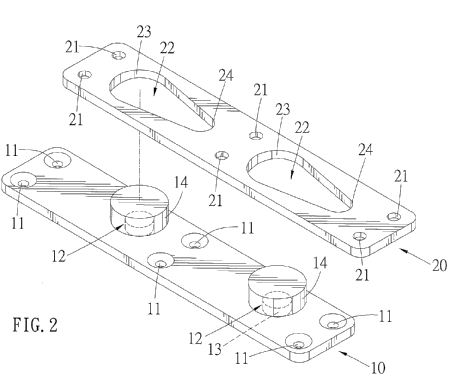 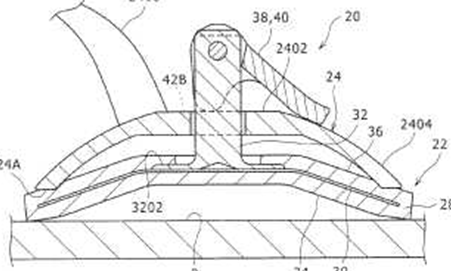 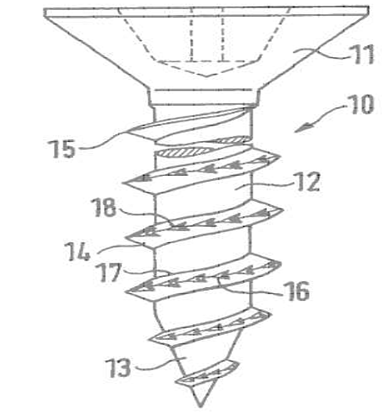 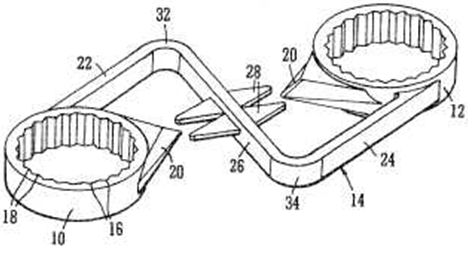 Curved fastening member used for fastening or securing constructional elements or machine parts together. 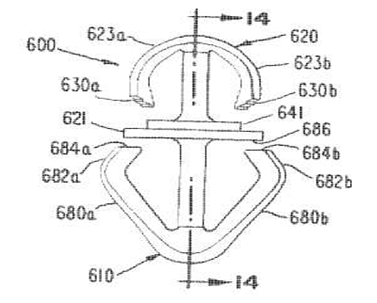 This group also covers snap-hooks for mountaineering. 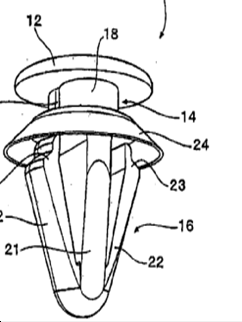 Suction cups, i.e. 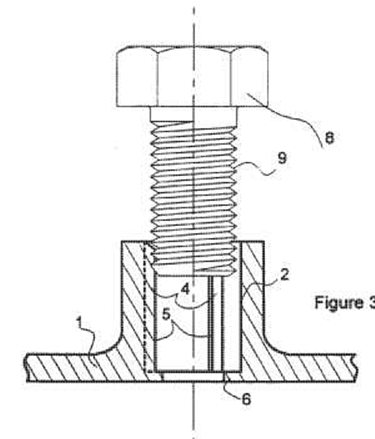 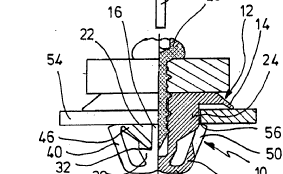 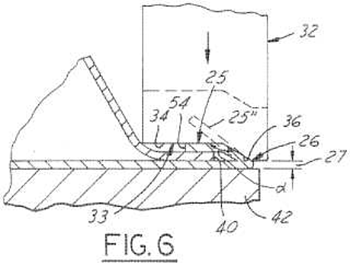 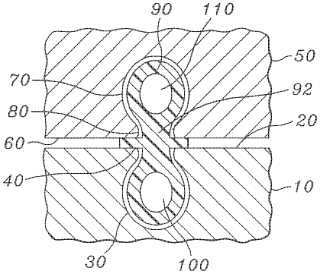 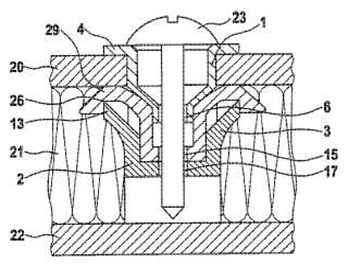 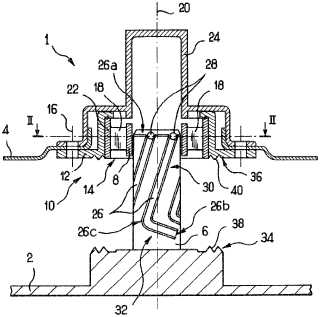 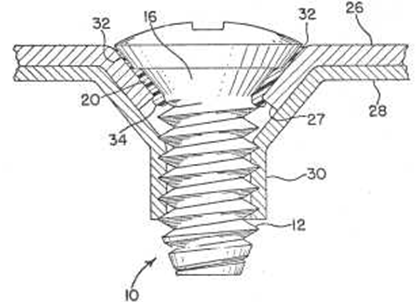 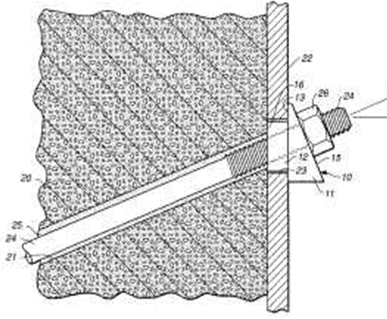 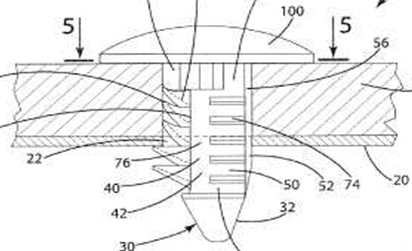 fasteners that uses negative fluid pressure of air or water to adhere to surfaces.